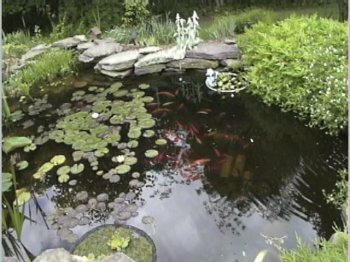 These are general photos of my 1800 gallon pond. 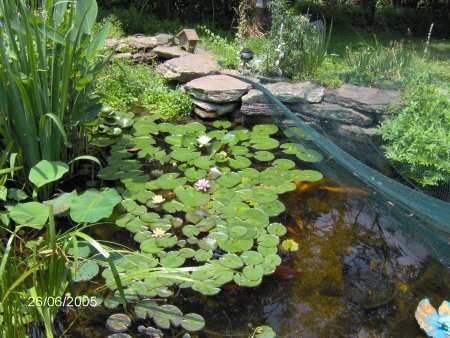 For more general information on these photos, see my pond pictures page index. 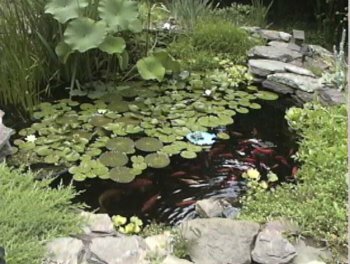 For photos of this pond that are predominantly fish (but also show the pond), see my fish pond photos page. 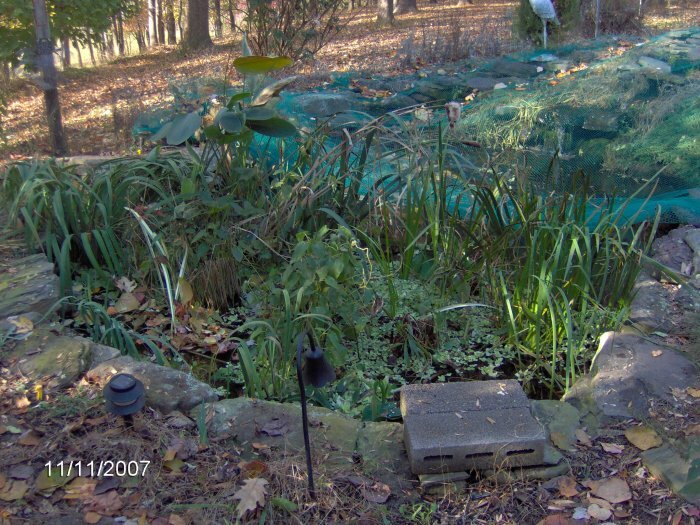 For winter photos of the 1800 gallon pond, see the winter photo page. Photos are listed from newest to oldest. 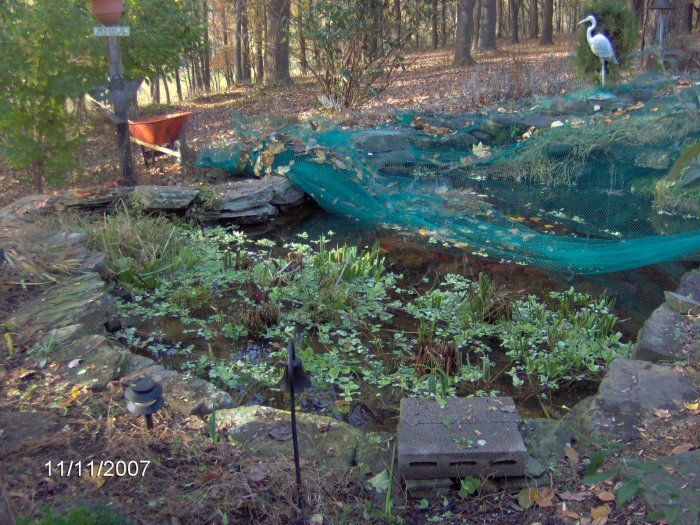 I took all these photos on 10/5/08, the day I put the leaf net on. The first three photos are taken with the net totally off while the next three are with the net on from the same photo locations. 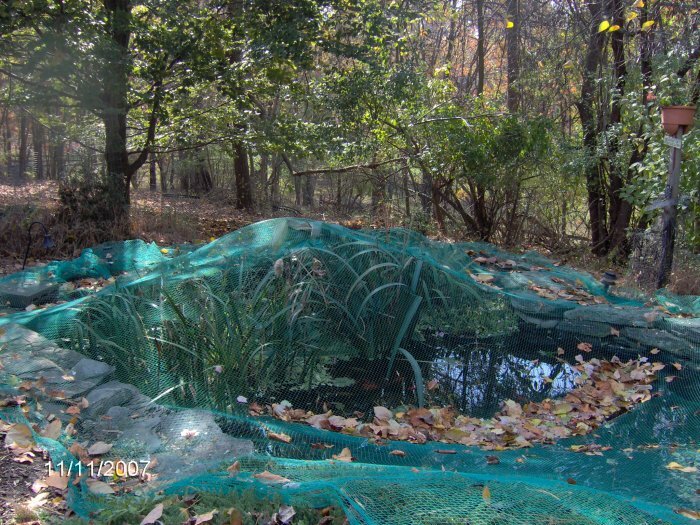 Pond facing southwest, net off. 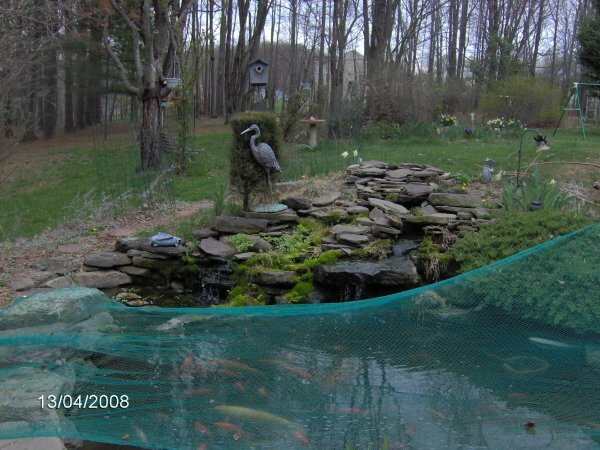 Pond facing west, net off. 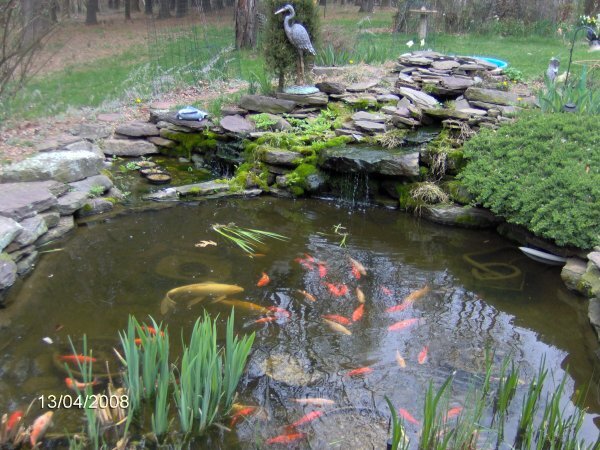 The koi, orfe, and goldfish are visible. 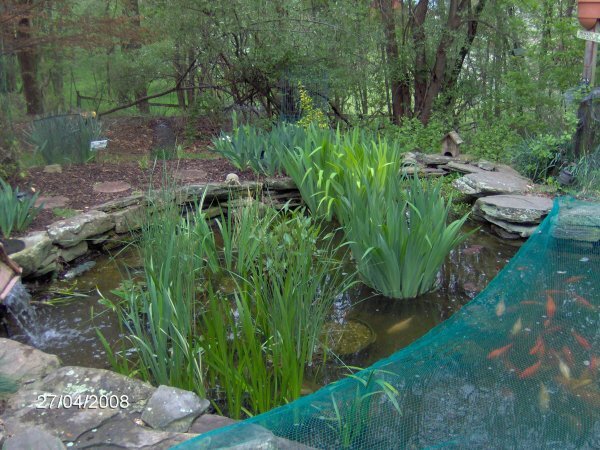 Pond facing north, net off. 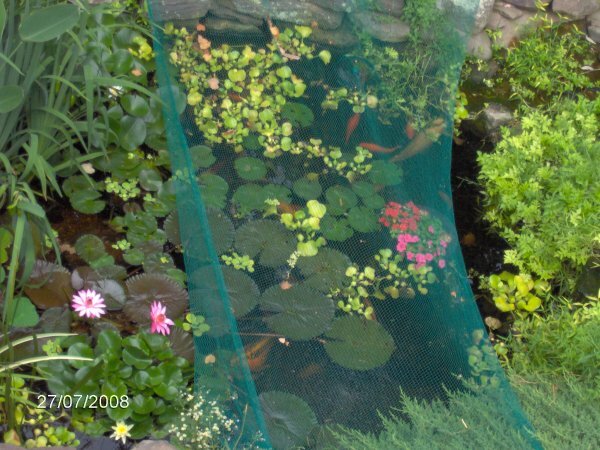 Pond facing southwest, net on. 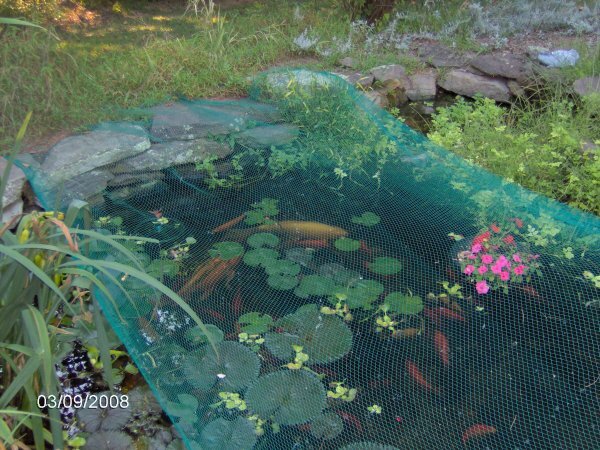 Pond facing west, net on. 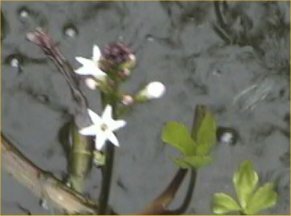 Colin (white koi) can be seen. 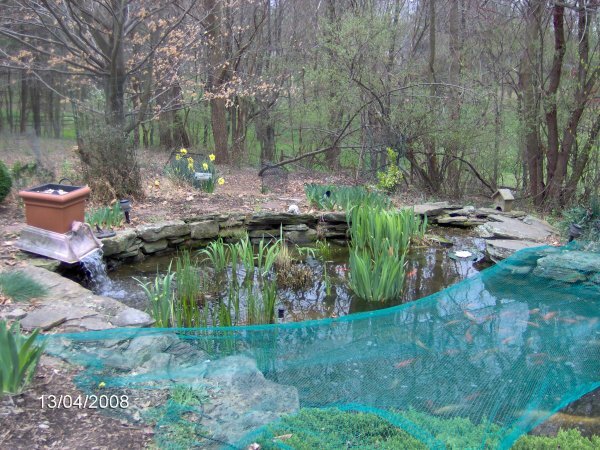 Pond facing north, net on. 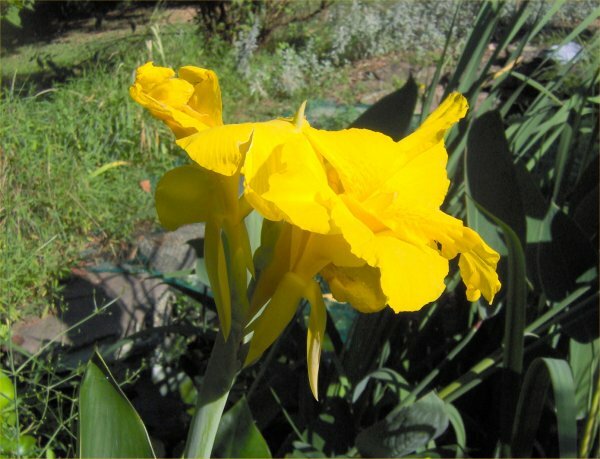 Yellow tropical canna in flower - with two sets of flowers! Pond north end, facing northwest; my koi, Maggie and Colin, can be seen under the net. 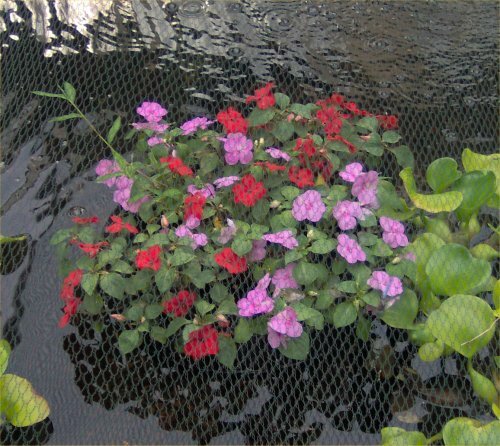 The impatiens are blooming in the floating island. 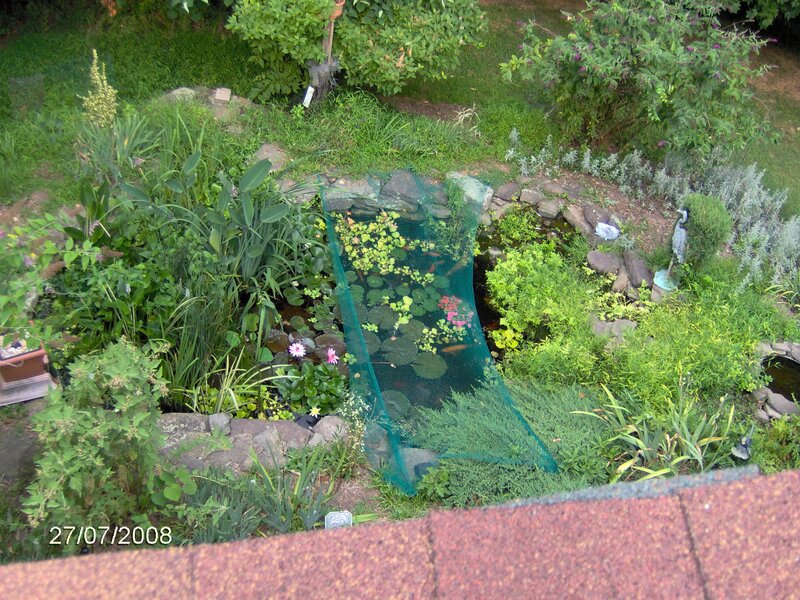 On 7/27/08, I took photos of the pond from the roof. 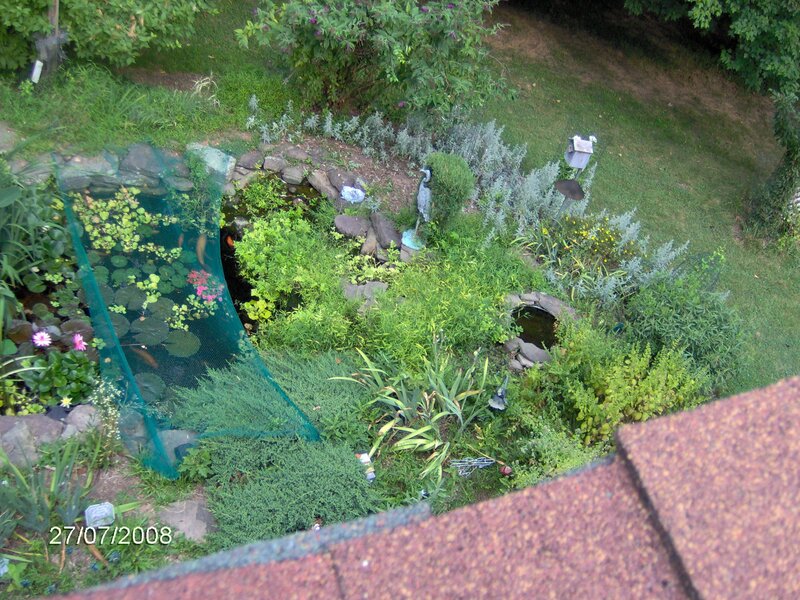 I also took some yard photos which I would not normally include here but, since they were also taken from the roof, I did. I have full size versions of four of the photos (they will take a while to load). Otherwise, the photos are smaller than the screen. 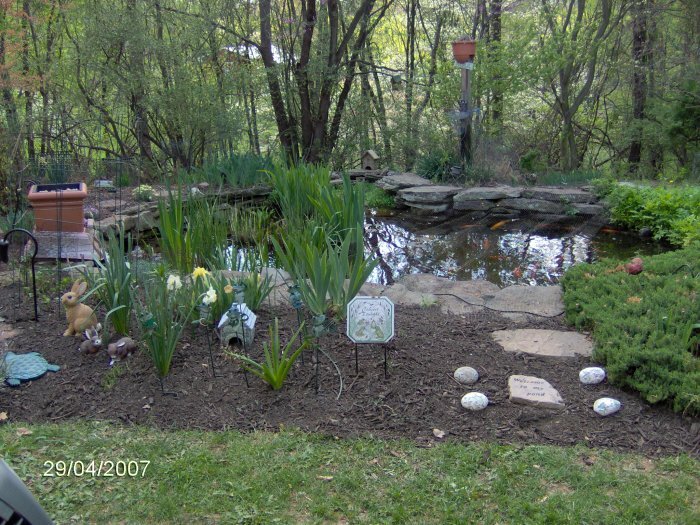 Pond - facing southwest; you can see the flowering lily and also a good view of my white butterfly koi, Colin. 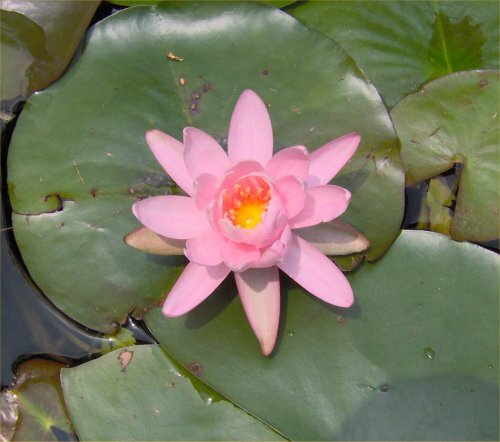 Firecrest waterlily flower - a little pink flower! 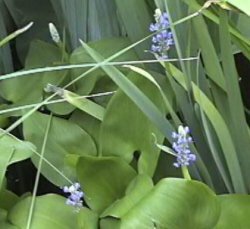 Flowering lizard tail - also some purple pickerel rush. 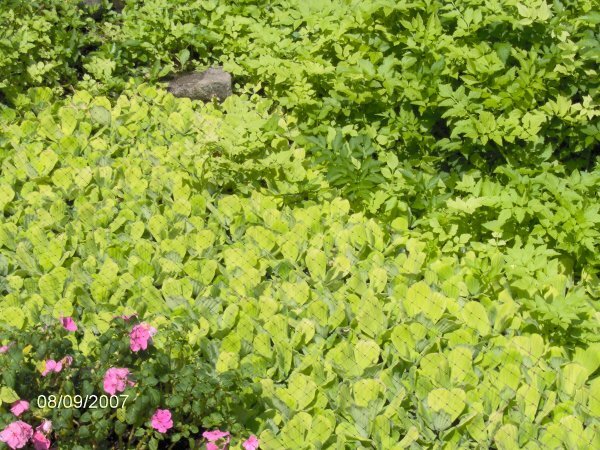 Yellowing-flowering watercress - This new bunch of watercress turned out yellow! 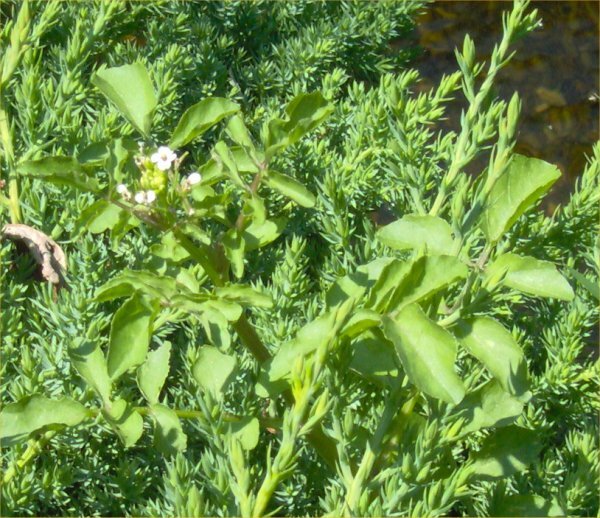 White-flowering watercress - Regular watercress in flower. 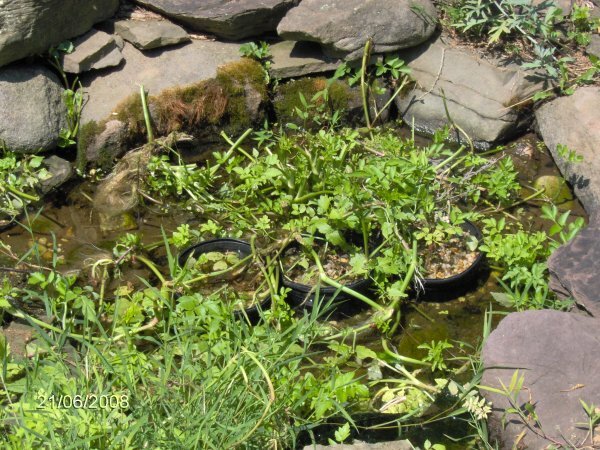 Water celery - severely damaged by the deer. 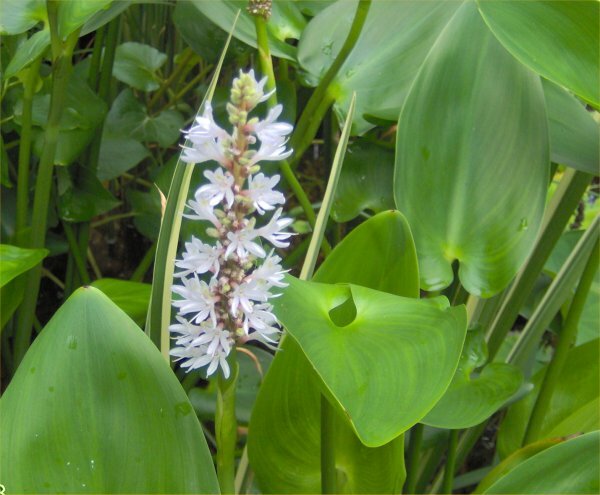 Marginals in bloom - blue pickerel rush, white pickerel rush, and lizard tail all in bloom in the marginal area. 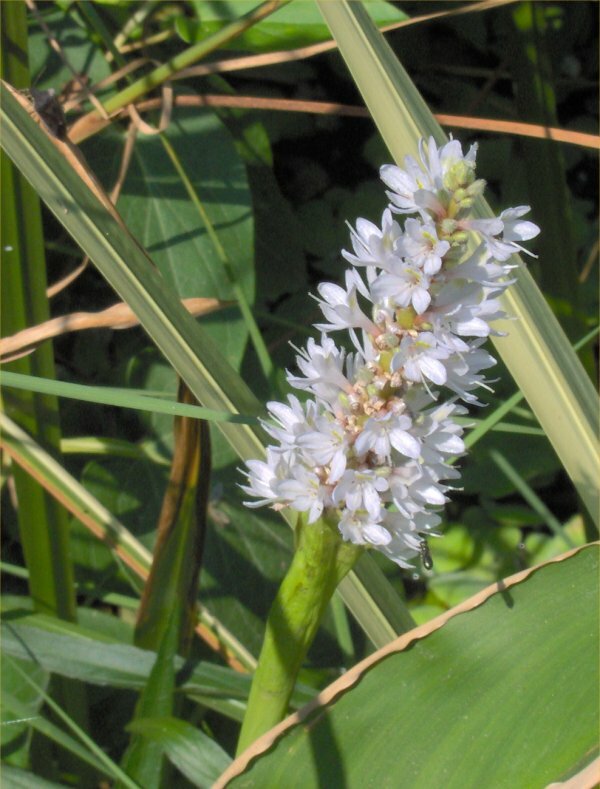 Marginals in bloom - blue pickerel rush, white pickerel rush, and lizard tail all in bloom in the marginal area, facing north. 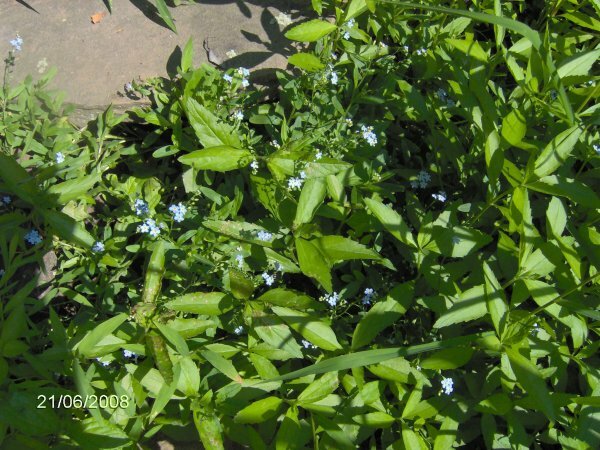 Flowering blue water forget-me-nots - the leaves are mostly frog fruit. 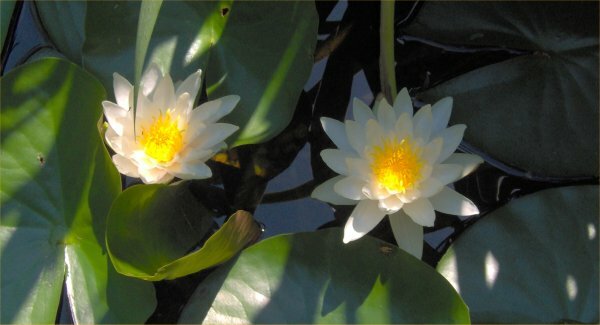 Flowering Albata waterlilies - two white waterlily blooms. 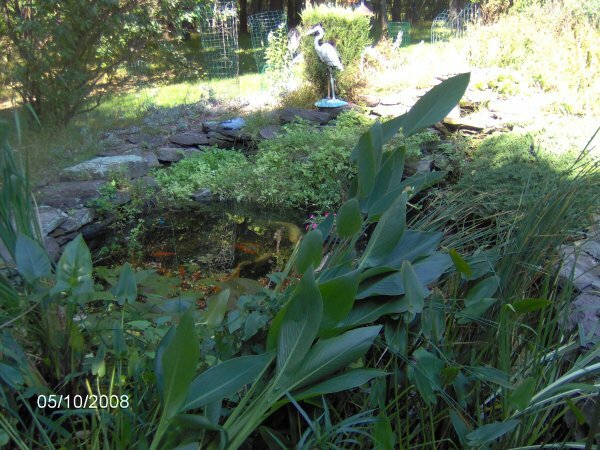 Pond - facing southwest, iris in bloom; my white koi, Colin, and one of the big orfe can be seen on the right. 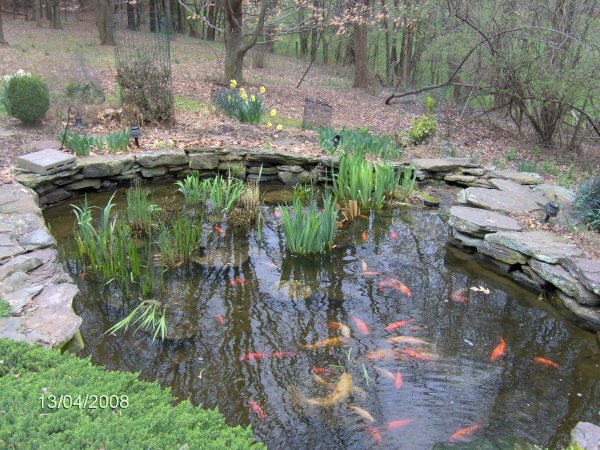 Here are some photos from 4/13/08 before and after I cleaned the pond up some as the goldfish had been spawning. 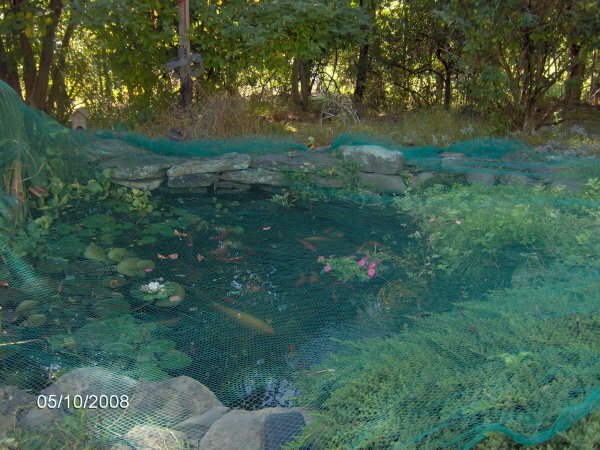 Pond facing southwest with the net off. 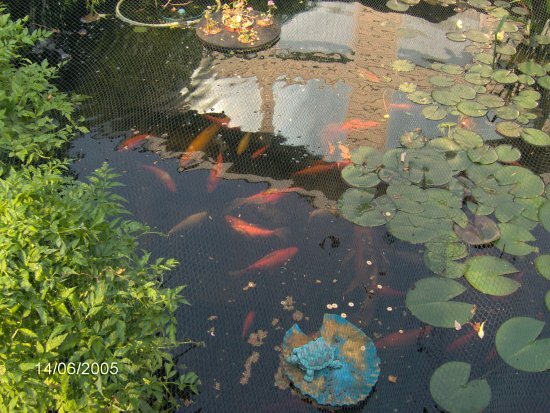 See the loose iris and general frenzy of the fish. 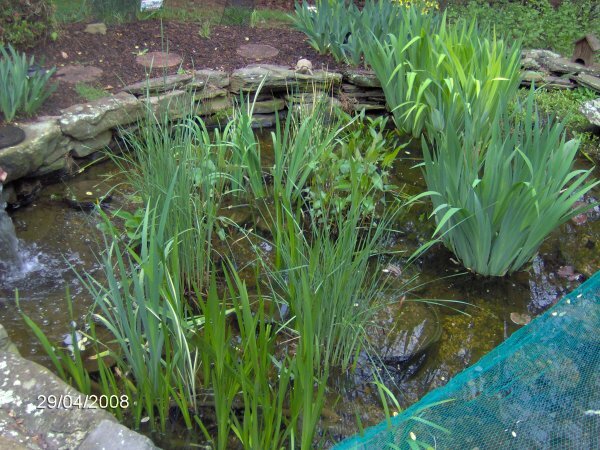 Pond facing north with the net off. 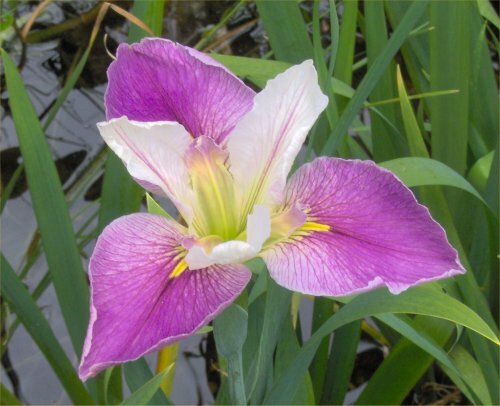 See the loose iris again. The waterfall is almost just a drizzle. 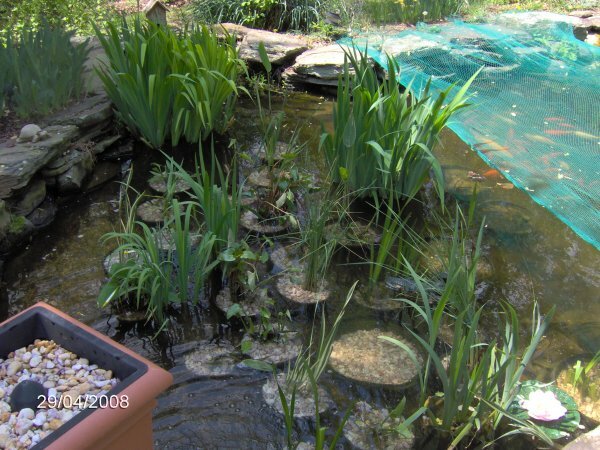 Pond facing southwest after cleaning and installation of the Cyprio filter. The partial net is on. 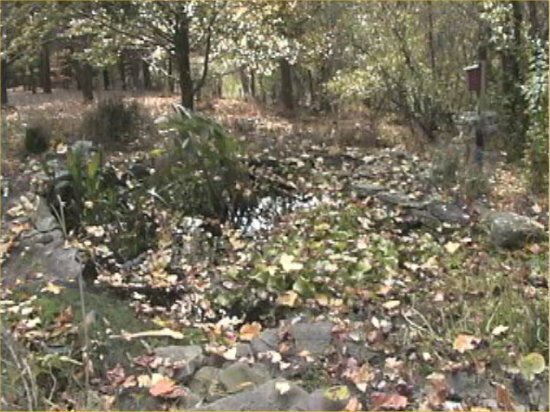 Pond facing north after cleaning. The partial net is on, and the falls are flowing more. There are two videos from that day on my fish videos page. 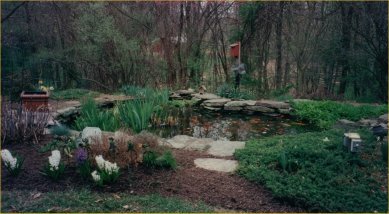 On 11/11/07, I cut down the marginals in the 1800 gallon pond for the coming winter and took some before and after photos. I also removed leaves off the net which I do weekly in the fall. 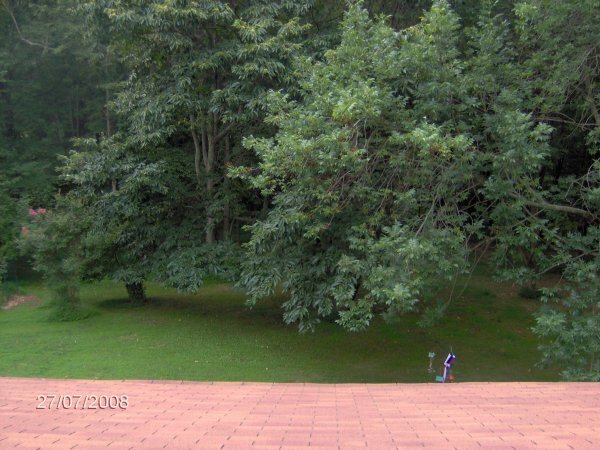 On 9/8/07, I took these two photos. 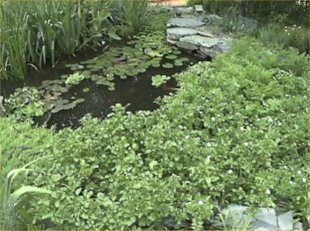 Water lettuce covering the pond - there is water celery at the top of the photo and the floating impatiens at the bottom. 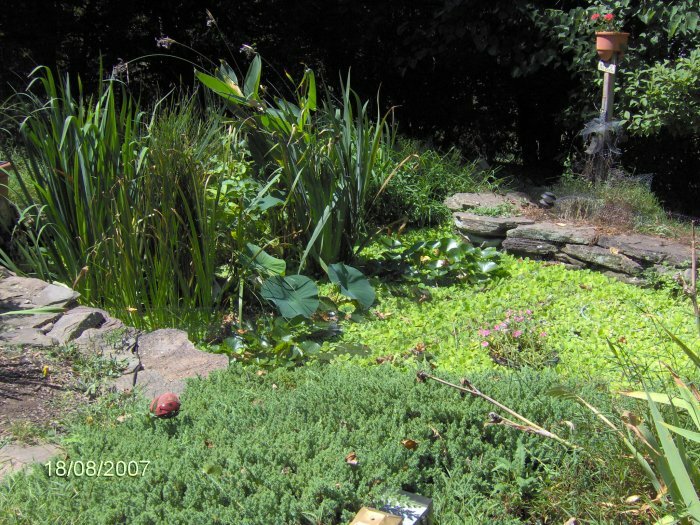 Pond on 8/18/07, facing southwest. The hardy canna is blooming (upper left tall things). 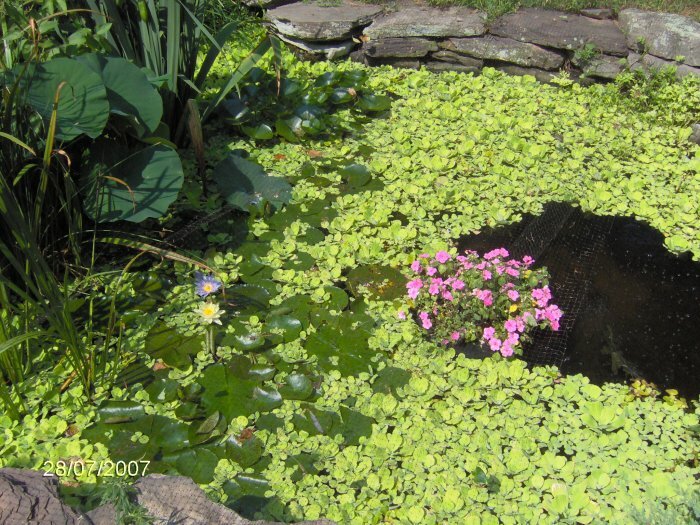 You cannot miss seeing the water lettuce as it covers almost the entire pond. 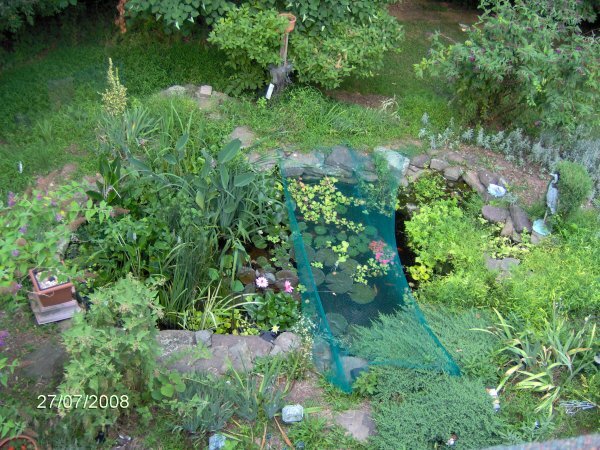 The first photo is of the entire 1800 gallon pond on 7/28/07. 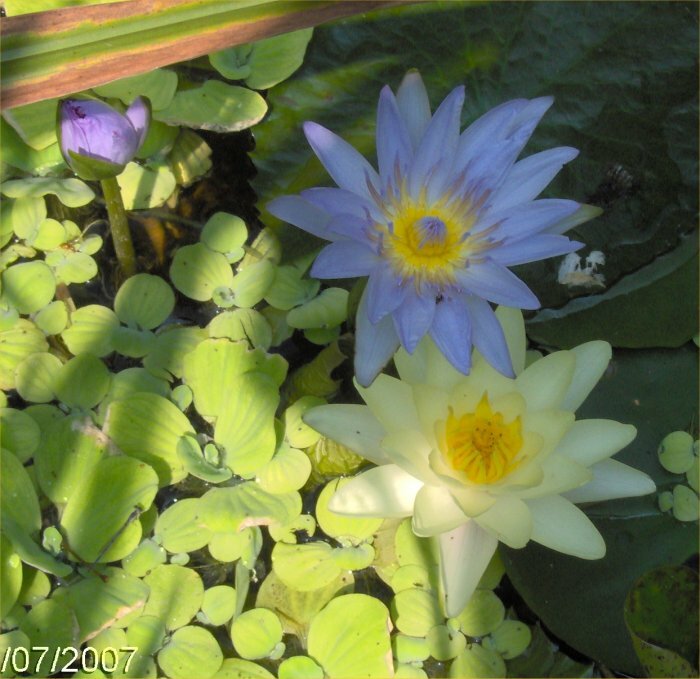 The next two photos are of an open yellow "Comanche" hardy water lily and an open "blue beauty" tropical water lily as well as a bud on 7/28/07. 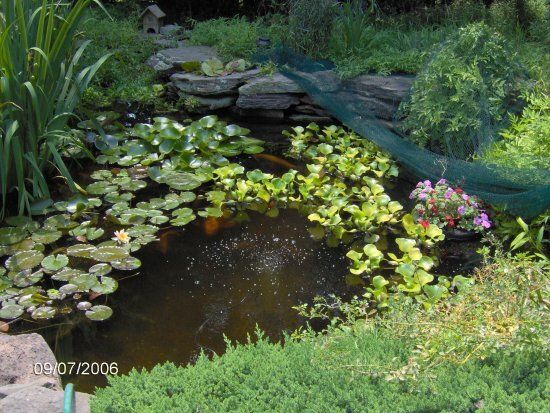 Pond - facing southwest, note the water lily flowers and the flowering impatiens in the floating island. 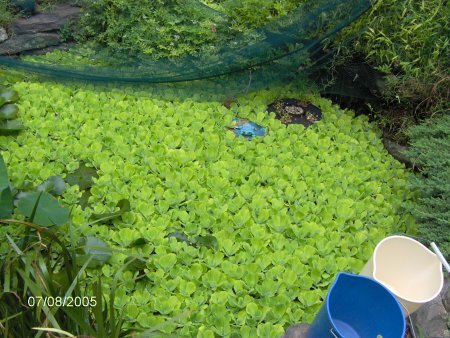 The water lettuce had grown to cover most of the pond by then. 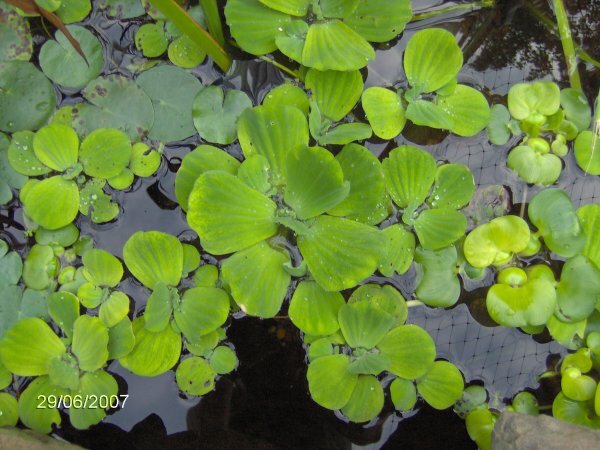 On 6/29/07, I took this close-up photo of some water lettuce plants. 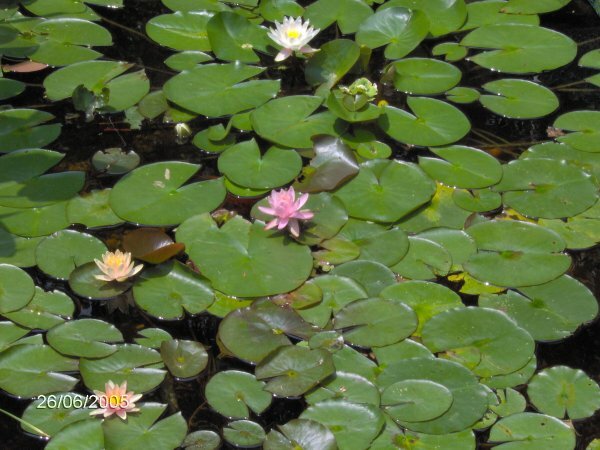 Water Lettuce. 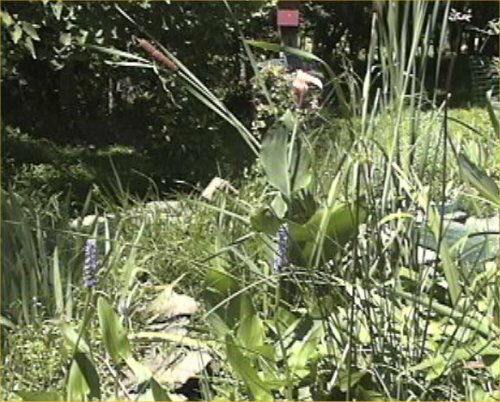 There are also some water hyacinth plants on the right and snowflake plants on the left. 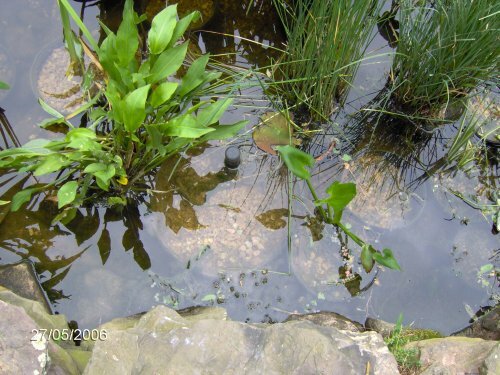 I took these photos of the 1800 gallon pond and pond plants on 6/28/07. 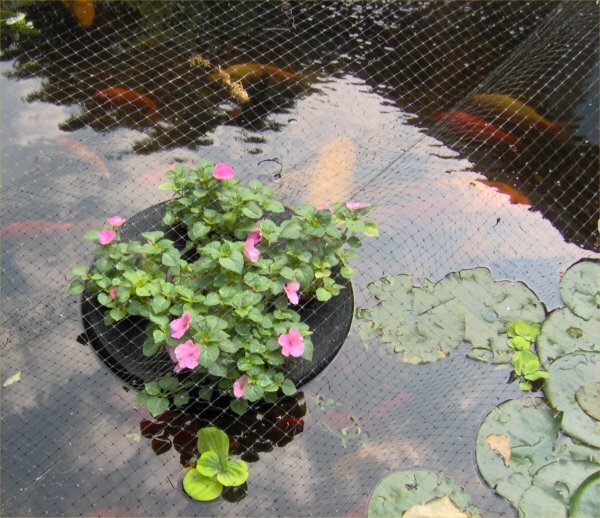 The Impatiens Floating Island . 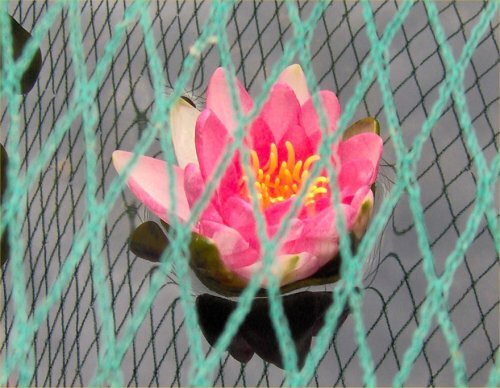 The fish can also barely be seen due to reflections, under the net. 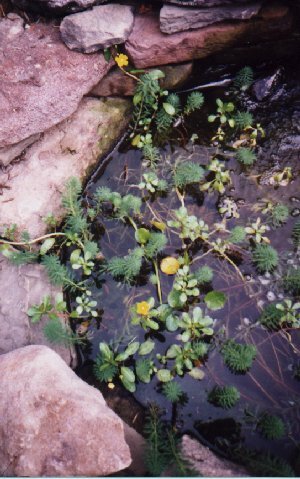 Water Celery in the waterfalls, facing northeast. The deer have chewed most of the water celery down. 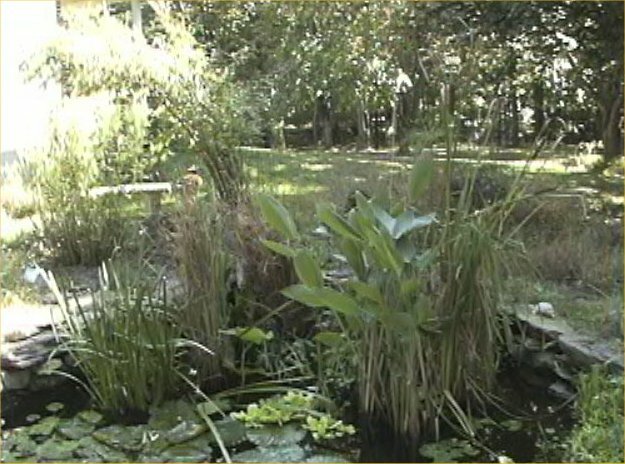 Pond - facing south, looking towards the marginal area. 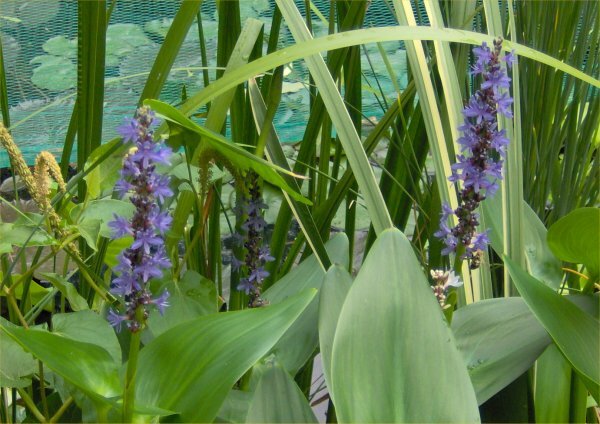 The just-about-to-flower hardy canna (also called alligator weed) are the highest plants. 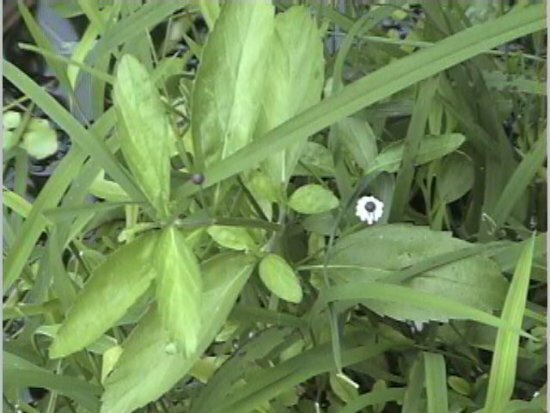 A few Albata white flowers are in bloom. 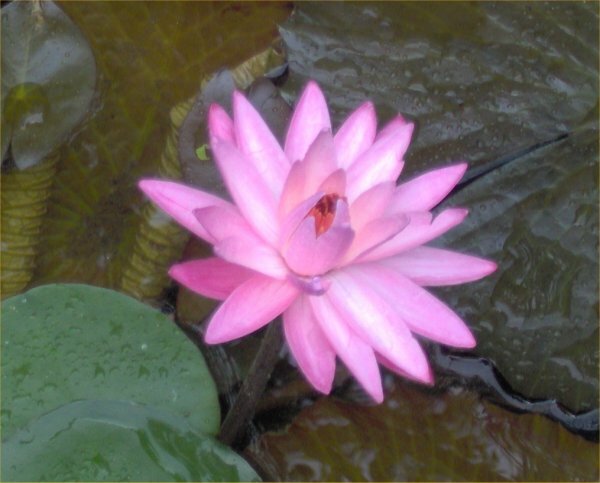 Close-up of flowering Fabiola pink waterlily - this is the same photo as below, the next day. 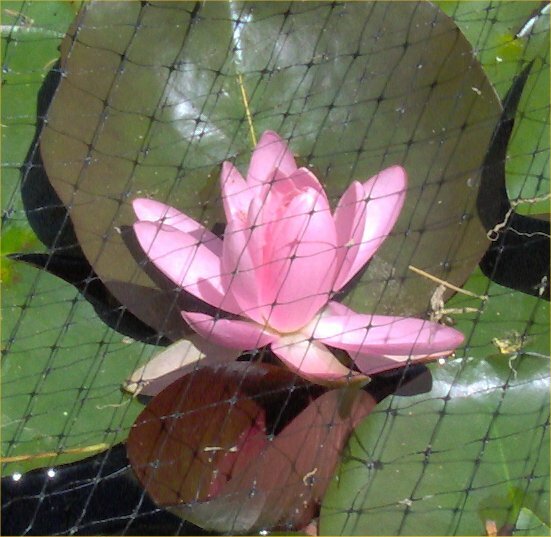 Fabiola waterlily flower on 6/23/07 through the net, taken from the east side of the pond. 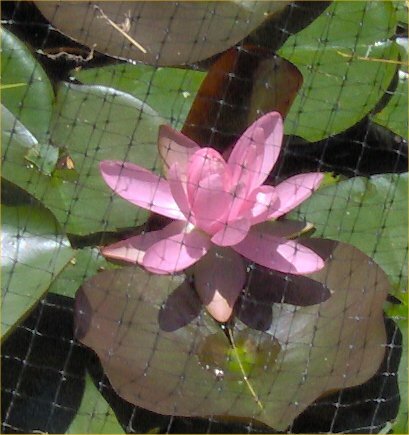 Fabiola waterlily flower on 6/23/07 through the net, taken from the west side of the pond. 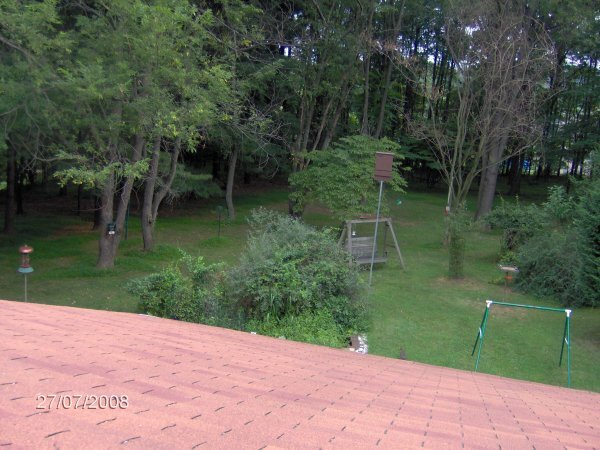 Marginal area on 6/23/07. 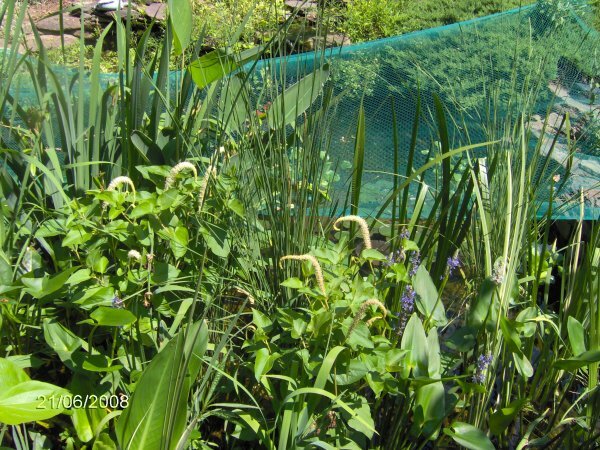 This photo was to show how the regular cattails and hardy water canna keep toppling over. 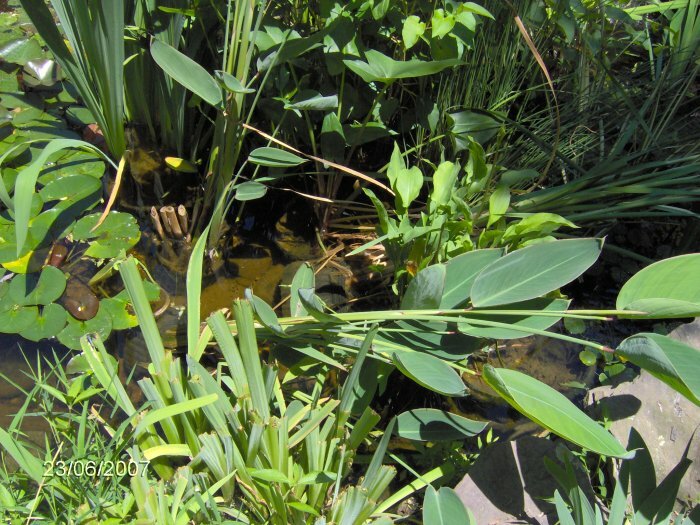 At the bottom of the photo can be seen what remains of the yellow flag iris that grew in the overflow area after I chopped them down after flowering to try to reduce the chance that they might puncture the liner as they are growing wild in there. 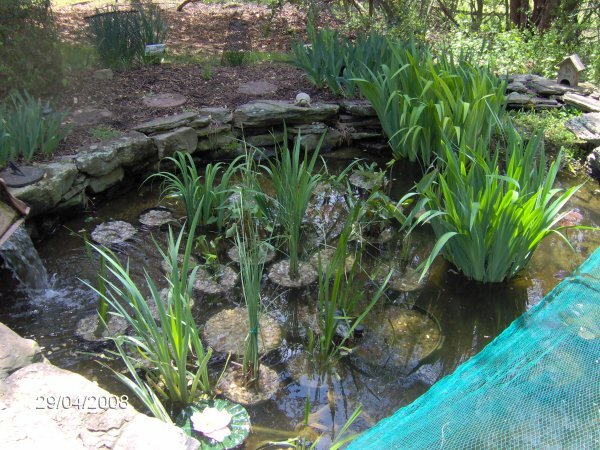 These three photos are not of the 1800 gallon pond. 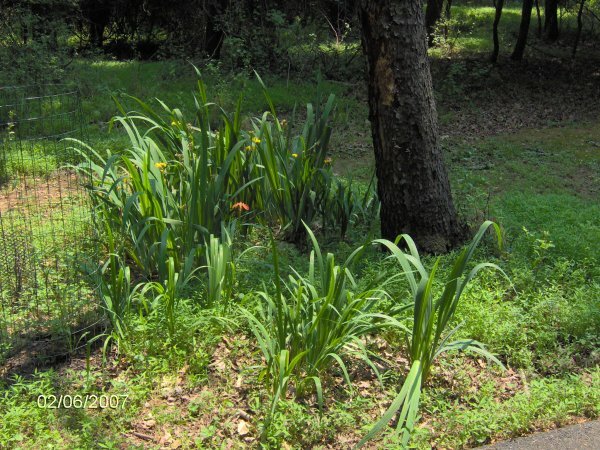 They are of iris that I transplanted from my 1800 gallon pond pots over to a low lying area in the front of the property. 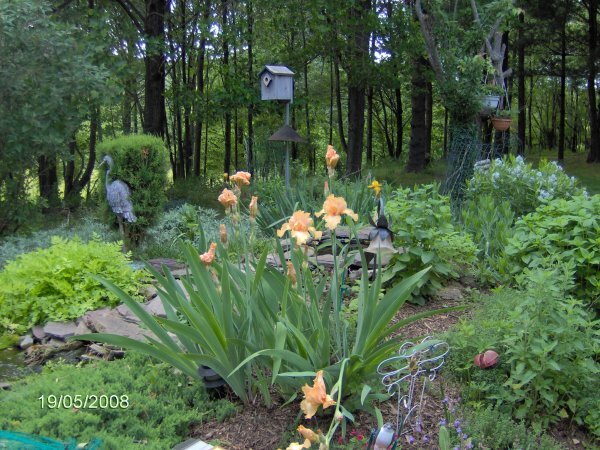 When I repotted the iris, I had a lot to get rid of and used to dig them into the ground out there. When it rains, that area floods but otherwise, it is dry. 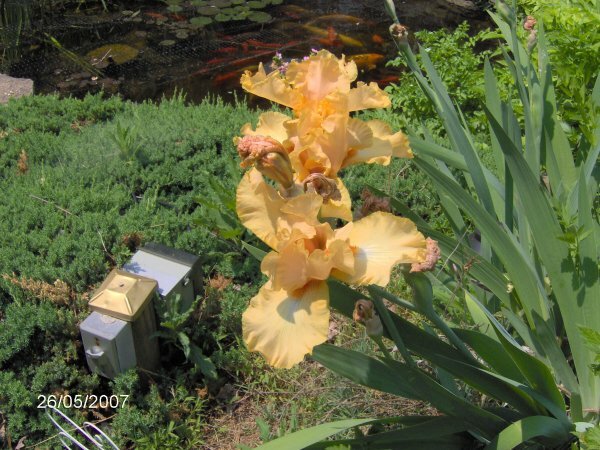 This last month, there has been a drought and yet the iris flowered well. 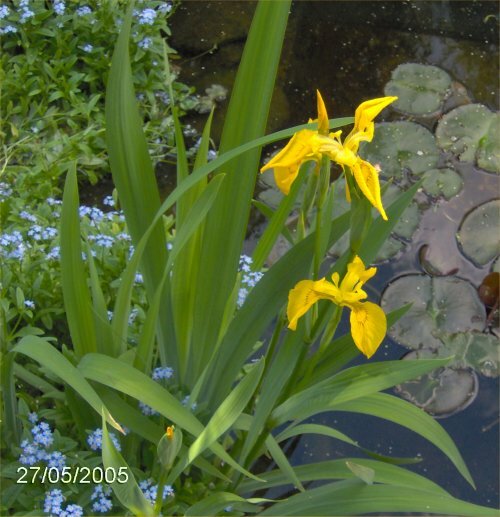 The yellow flag iris in the back of the third photo have just finished flowering. 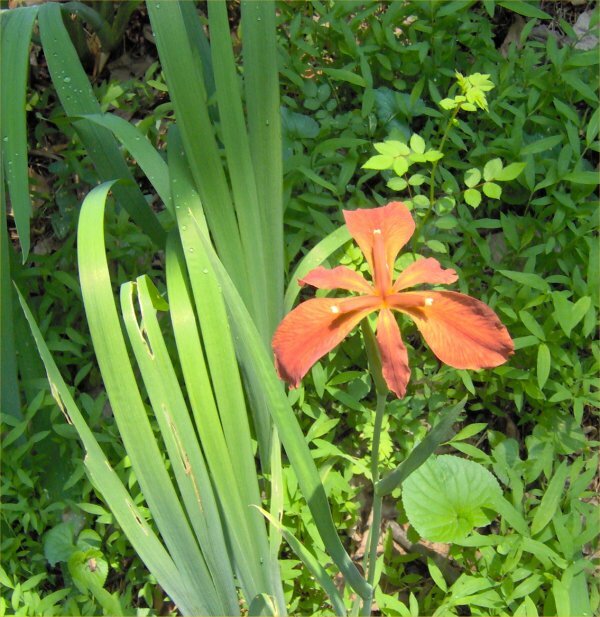 I was surprised to discover a red fulva iris flower here on 6/2/07. 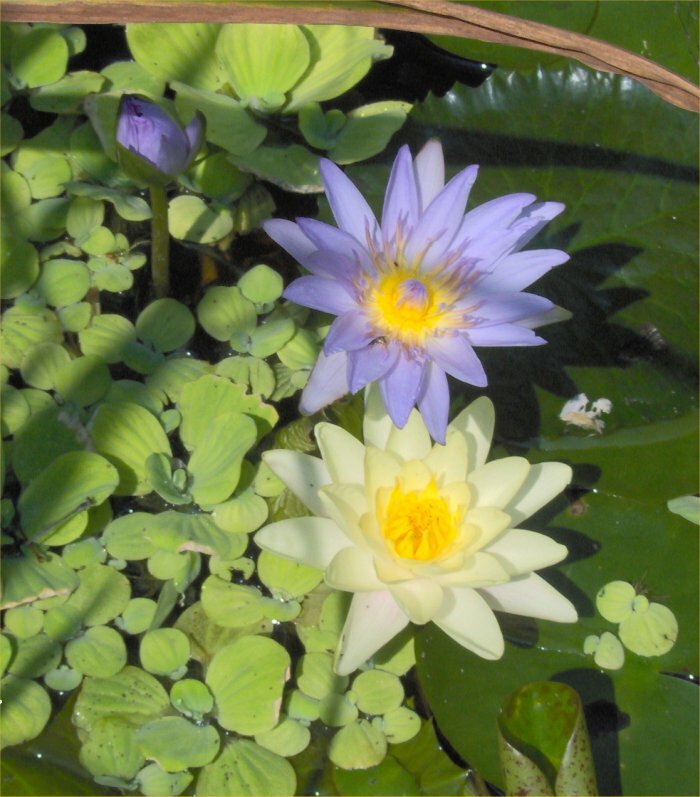 The original plant in the pond died a few years ago so this was a nice surprise. I actually bought a new one this year but now it looks like I could dig some of this one up if I wanted to (probably will not). 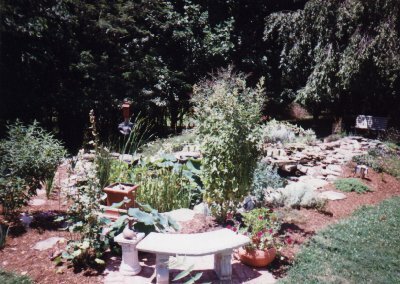 Pond facing southwest. 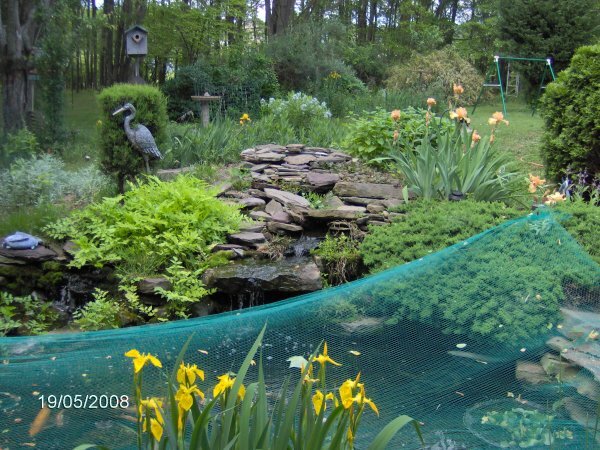 You can see the Cyprio filter, yellow flag iris in bloom, blue water forget-me-nots in bloom, and the fish. 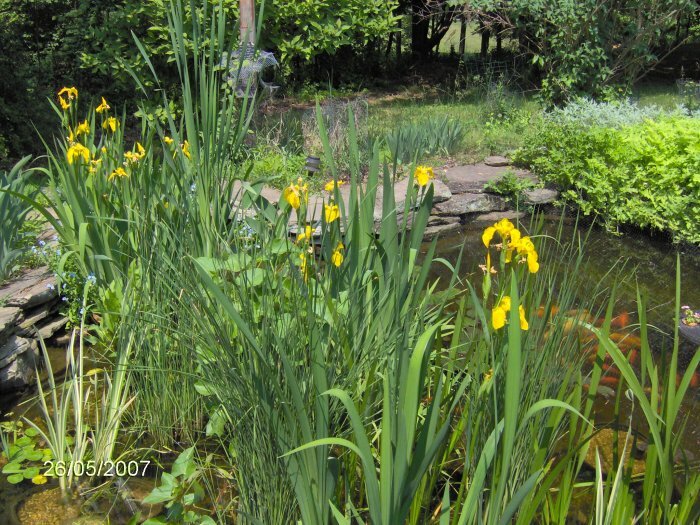 Pond facing northwest over the marginal area with the blooming yellow flag iris. 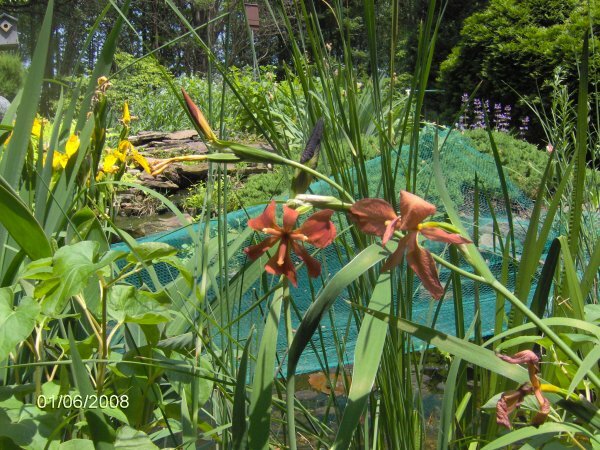 Orange standard iris with the pond and fish behind them. Those iris are one of my favorites. 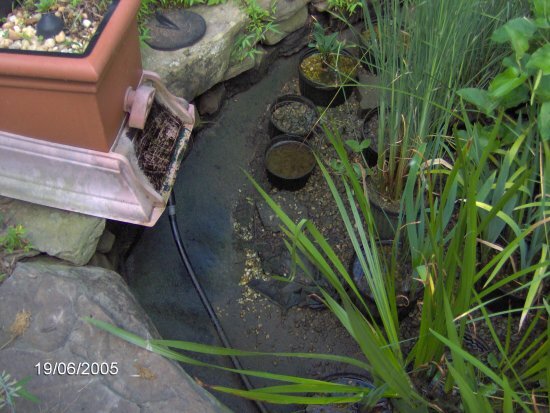 You can also see the pond's electrical outlet. 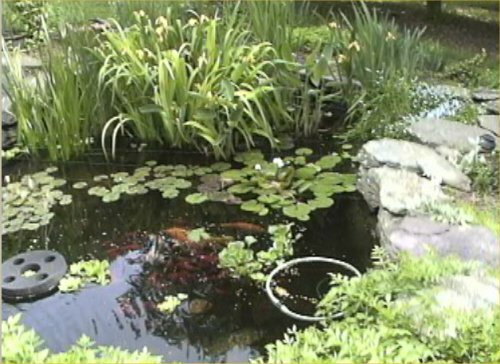 I also took two pond videos on this day which you can see on my fish and pond videos page. 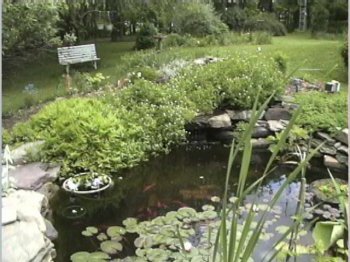 Pond facing southwest. 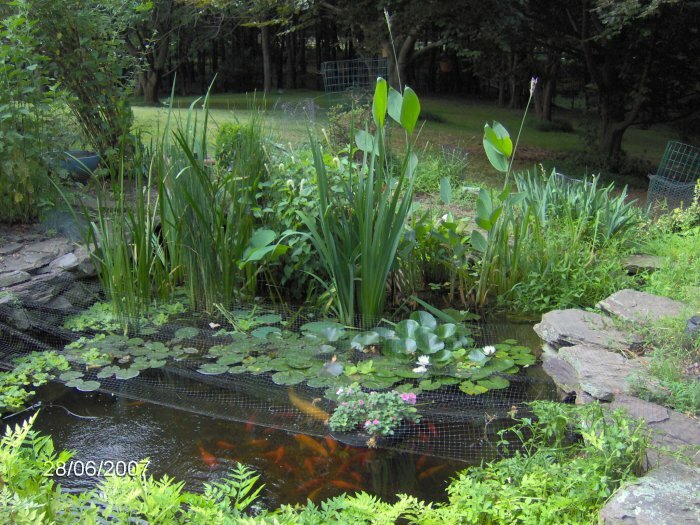 You cannot really see much of the pond. 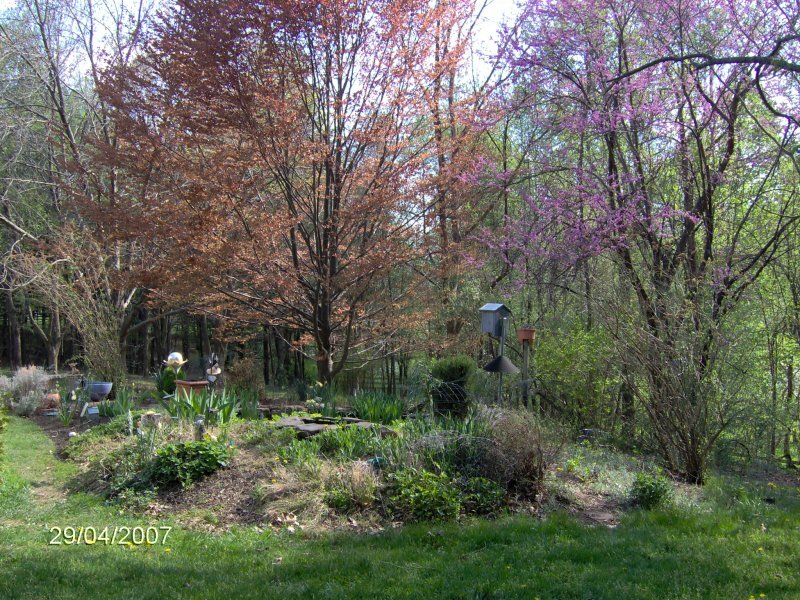 The red bud tree is in bloom. 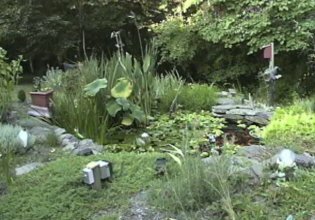 Pond facing northeast (closer in). 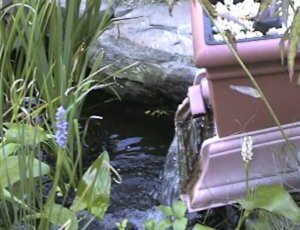 You can see the koi, goldfish, and water celery in the waterfall. 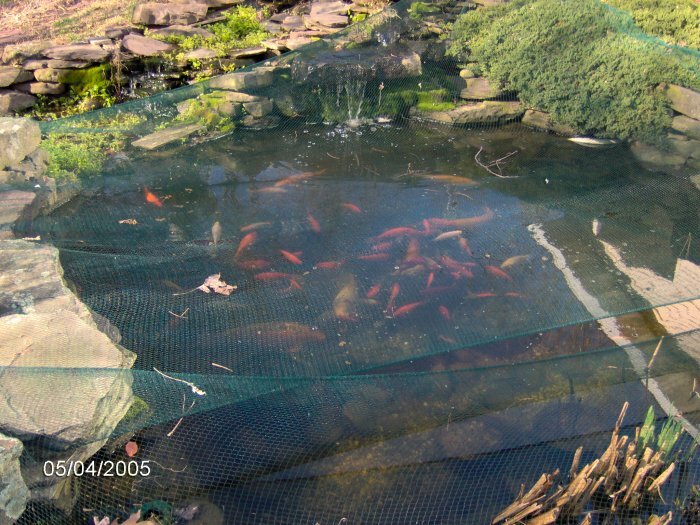 Pond netted and facing southwest, 12/1/06. When I went to get the digital photos on the camera, I found this photo that my father took. 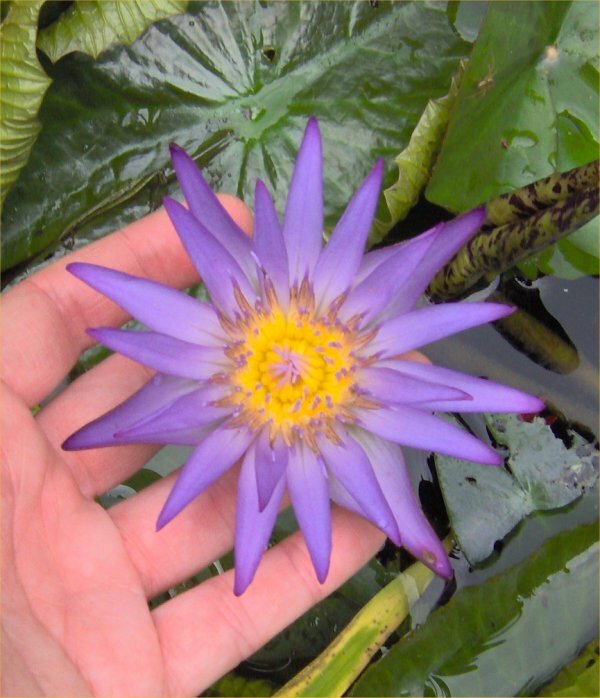 Nora tropical waterlily flower on 9/27/06. 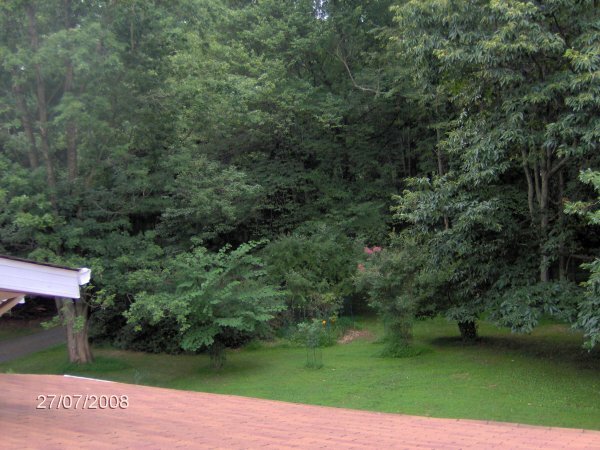 Pond facing northwest on 8/31/06. You can see that there are no floating plants this year since they died for some unknown reason. 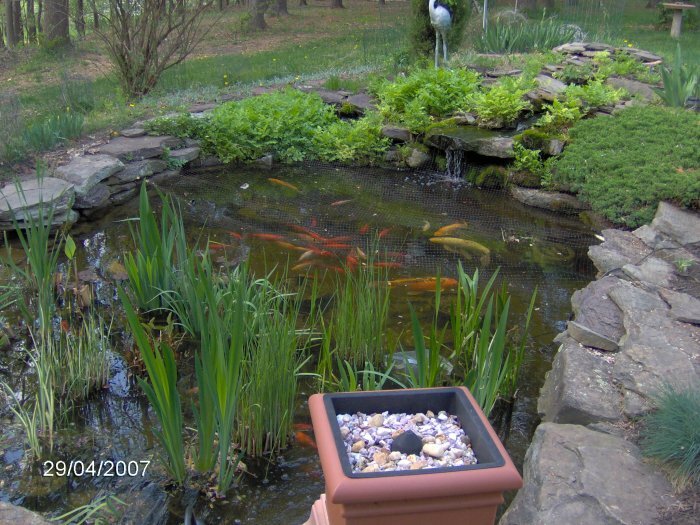 Also, you can see my orfe, koi Colin, goldfish, impatiens, and a blue waterlily flower. 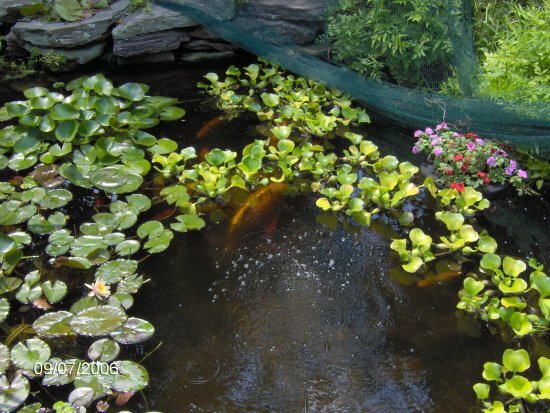 Pond - same sort of photo as the last one. 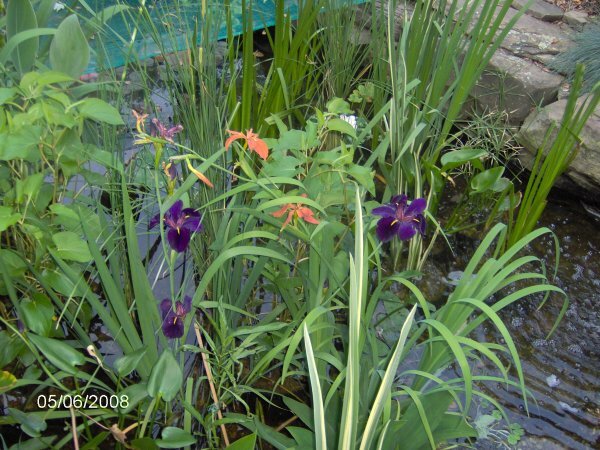 There are 16 pond and iris photos on my page that has details of my repotting three iris on 9/4/06. 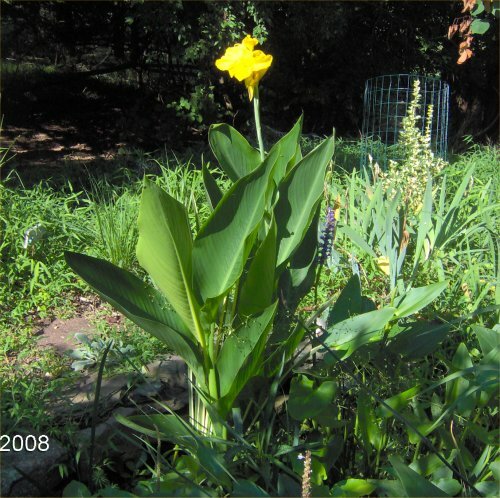 Hardy canna flower on 8/6/06. 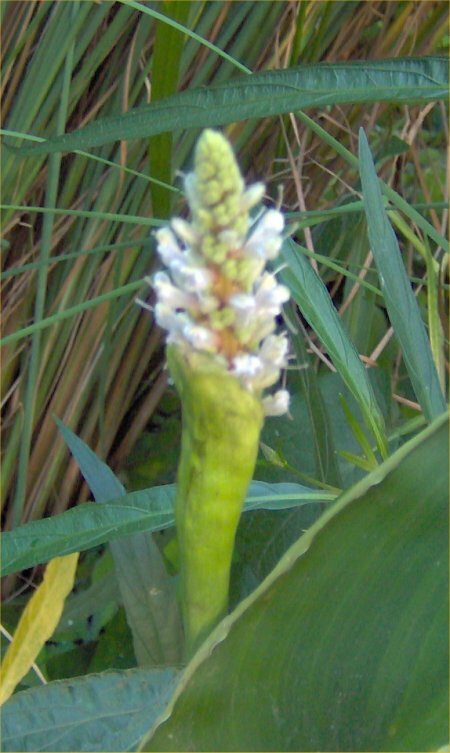 This is a close- up of one of the hardy canna flower heads. 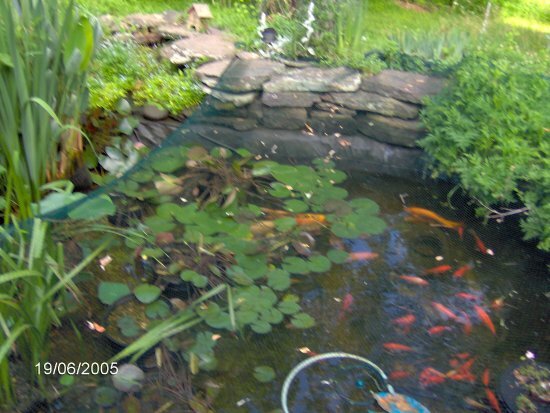 You can just make out the "Beware of attack goldfish" sign behind it that my mother had to buy. 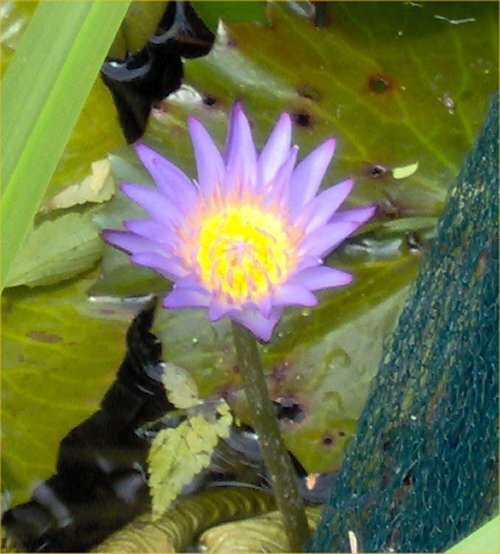 Four tropical waterlily flowers on 8/6/06. 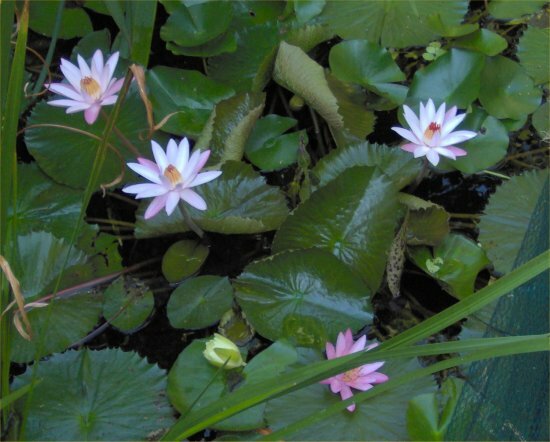 In this early morning photo, you can see four of my pink/white tropical nightblooming lily flowers are open. 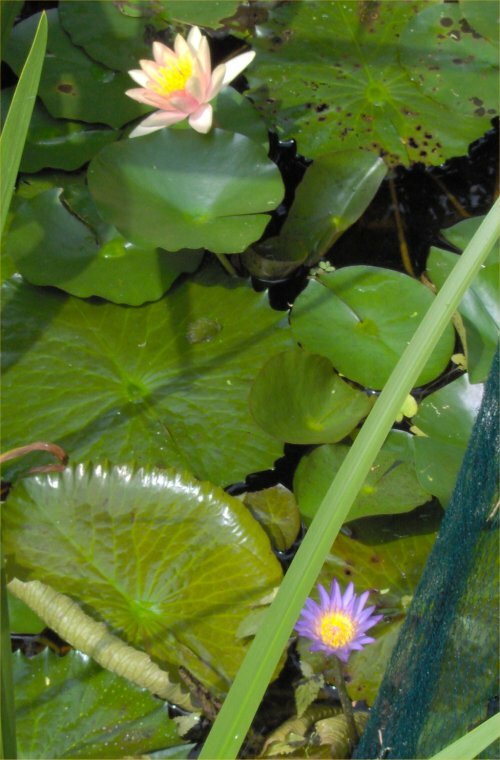 At the bottom is a Chromatella yellow hardy waterlily flower that has not yet opened for the day. Waterlilies - A Comanche hardy waterlily flower at the top and a Nora tropical waterlily flower, taken 7/22/06. Nora tropical waterlily flower - close-up, taken 7/22/06. Waterfall spillway on 7/13/06. 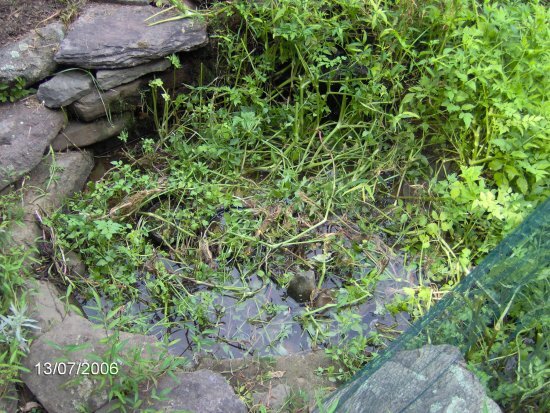 This area was full of water celery where the waterfall comes out. 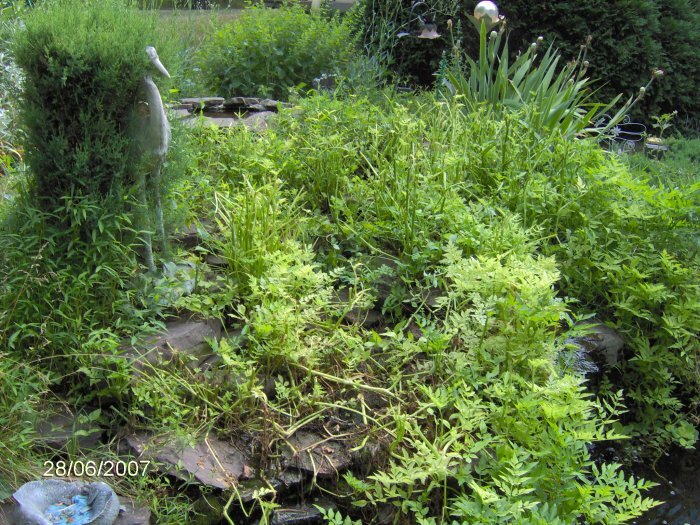 You can see the deer ate most of the water celery. 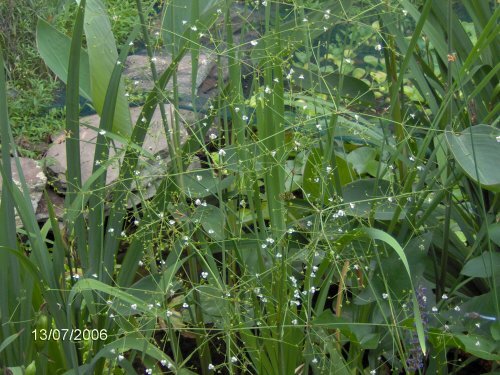 The flowering impatiens under the net and in the floating island on 7/13/06. Two frogfruit flowers on 7/13/06. 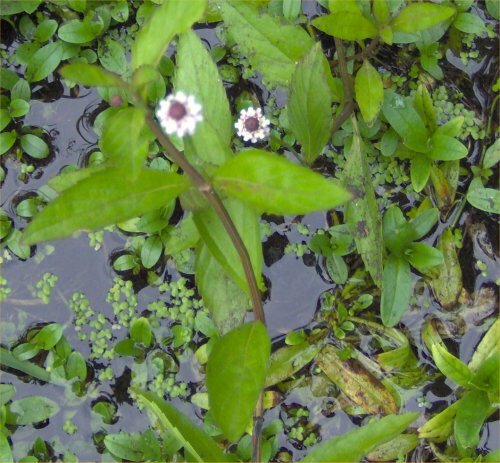 Below that is some duckweed and water forget-me-nots (not in flower). 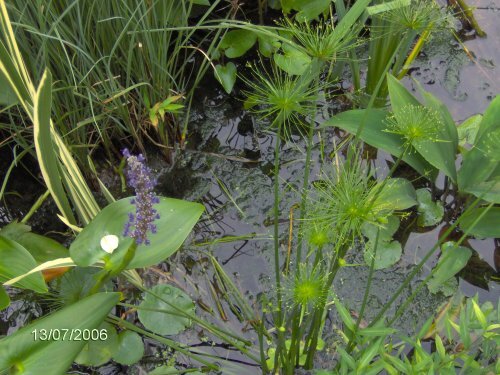 Plants in the marginal area on 7/13/06 including dwarf papyrus (middle), variegated sweetflag (top left), and pickerel rush with one flower (left). 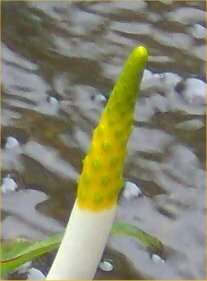 Water plantain flowers on 7/13/06. 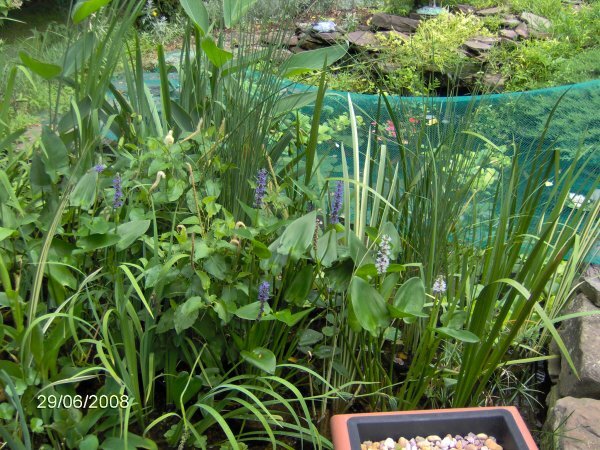 Behind that is hardy canna, iris, and lots of other plants. Big pond facing west on 7/9/06. 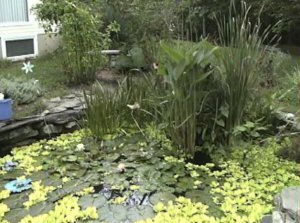 You can see my koi Maggie coming out from behind the water hyacinth, blooming impatiens in the floating island, and one Comanche lily flower. Big pond facing west on 7/9/06. This is just a closer view of the last photo. 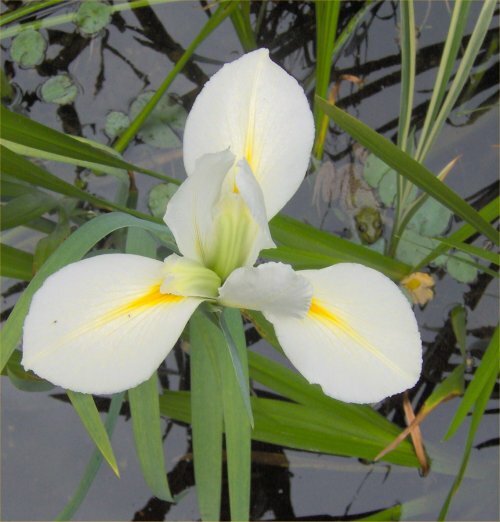 White iris flowering on 5/27/06. 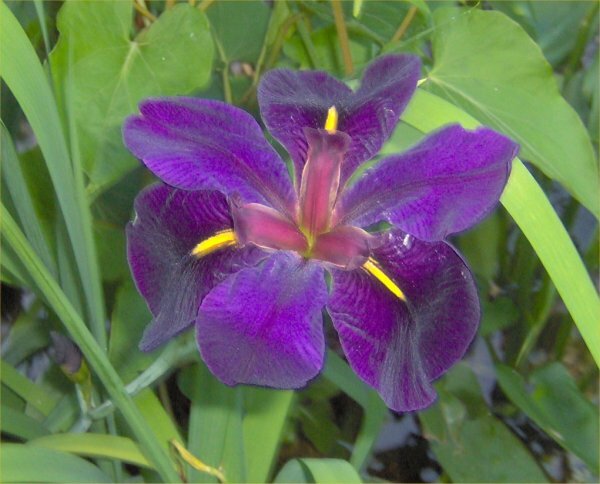 This was supposed to be a black gamecock iris! 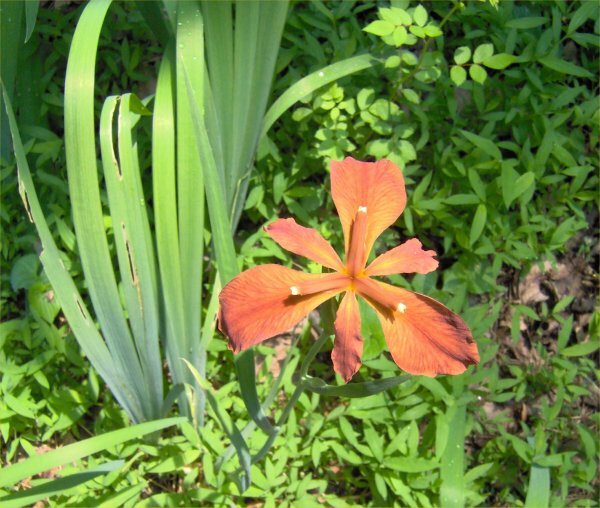 Colorific iris flowering on 5/27/06. 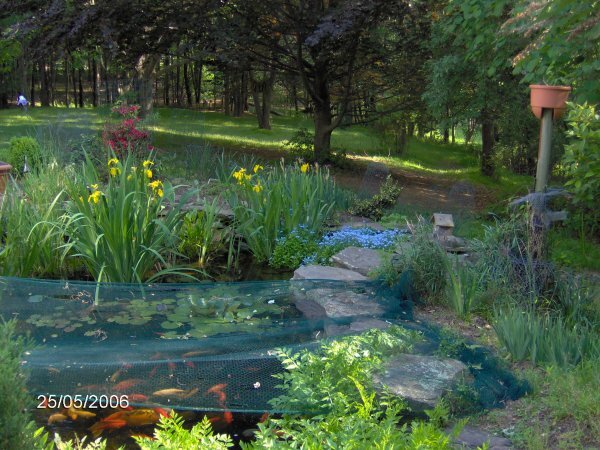 Shallows at the south end of the pond on 5/27/06. 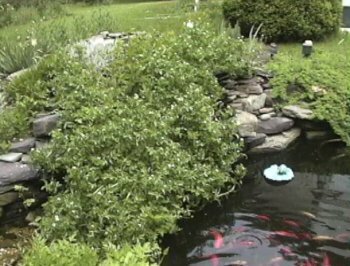 This is where the American yellow lotus is in the big pot and where the raccoons keep making a mess, and the goldfish keep spawning and making a mess. 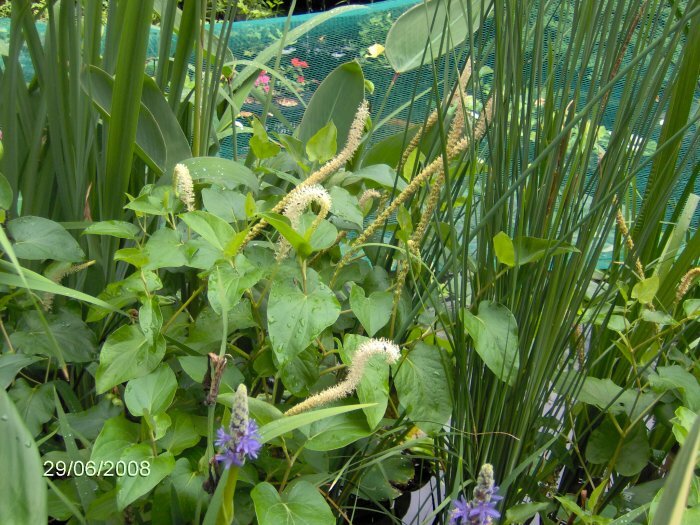 The bottom right plant is pickeral rush, the lotus is in the middle, water plantain is on the left, the far right is variegated sweetflag, to the left of that is cotton grass, and to the left of that is dwarf cattail. 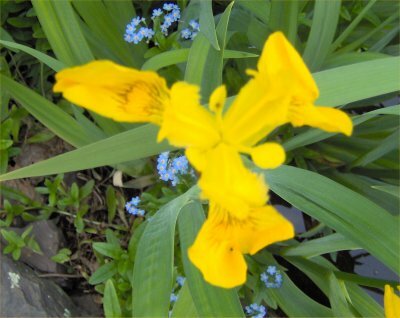 Yellow flag iris and forget-me-nots flowering on 5/25/06, close-up. 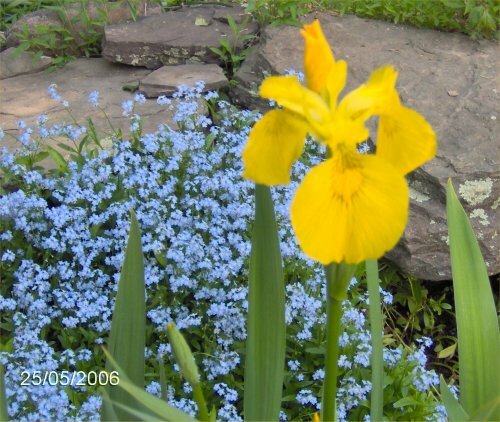 Yellow flag iris and forget-me-nots flowering on 5/25/06. 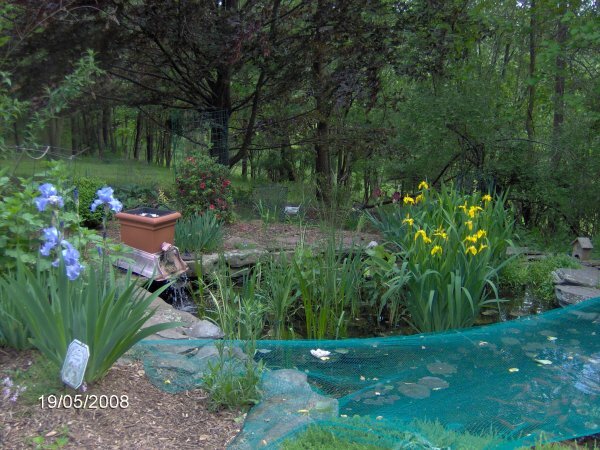 Pond facing south with flowering yellow flag iris and forget-me-nots on 5/25/06. 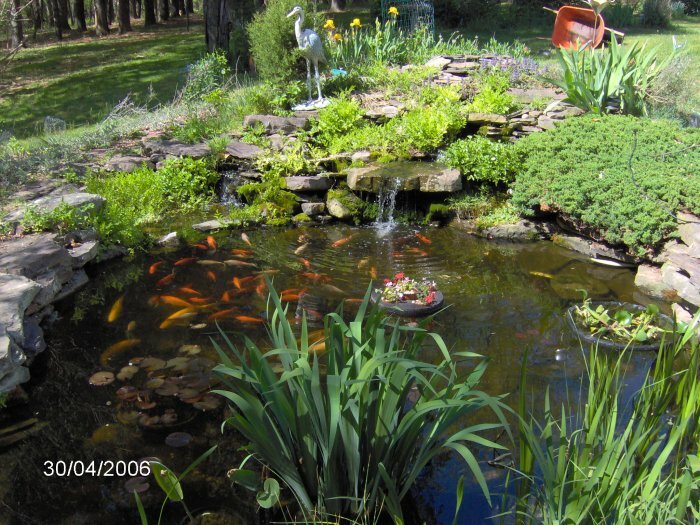 You can also see my koi, Maggie at the bottom left along with some goldfish. Pond facing north on 4/30/06. 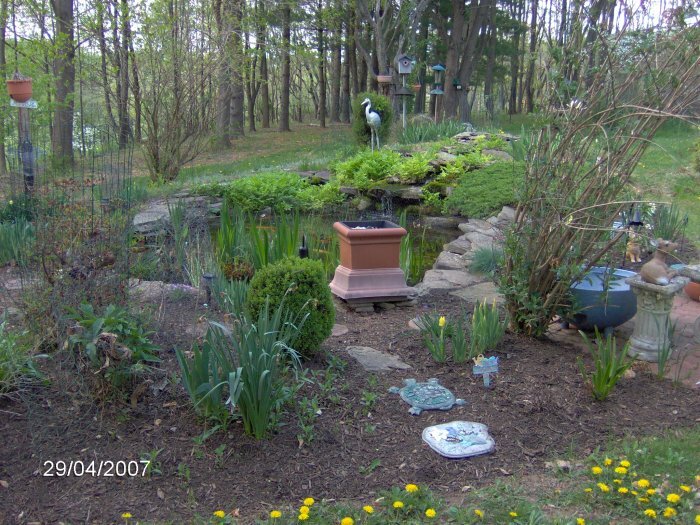 On 4/19/06, I took five photos of the garden around the 1800 gallon pond. 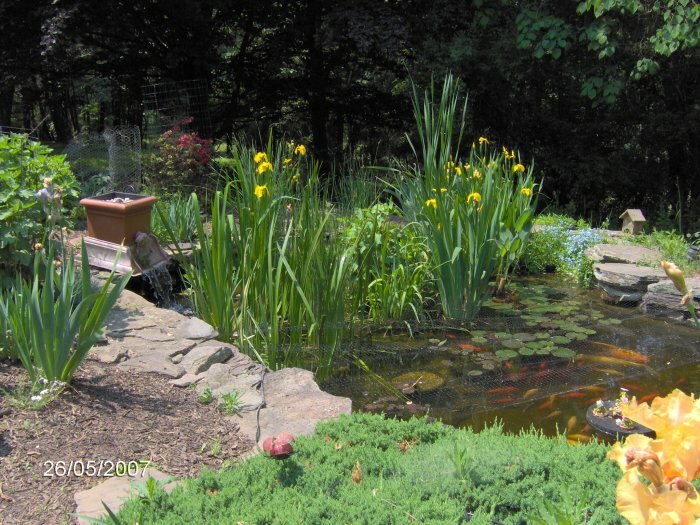 The pond can be seen in the photos as well. 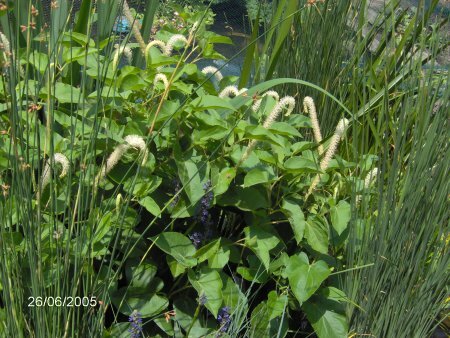 They are on my terrestrial gardens page. Pond on 3/26/06 facing southwest. You can see all three remaining orfe. Hair algae in the little stream on 3/9/06. 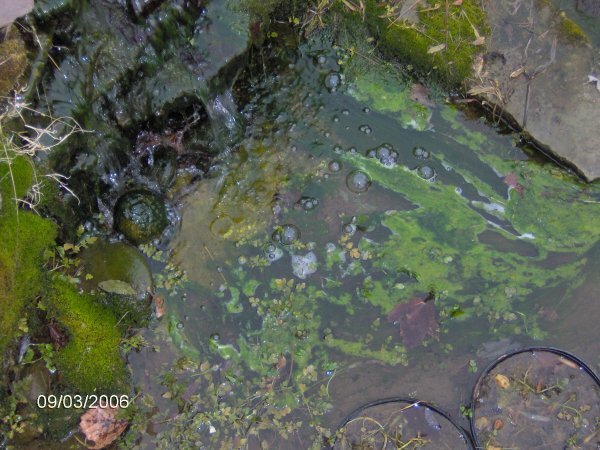 Hair algae in the stream outflow (mini pond) on 3/9/06. 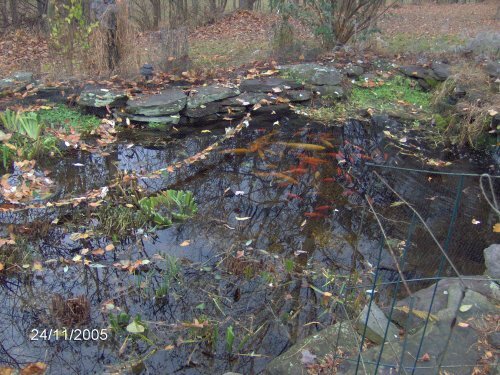 Pond facing north on 11/24/05. 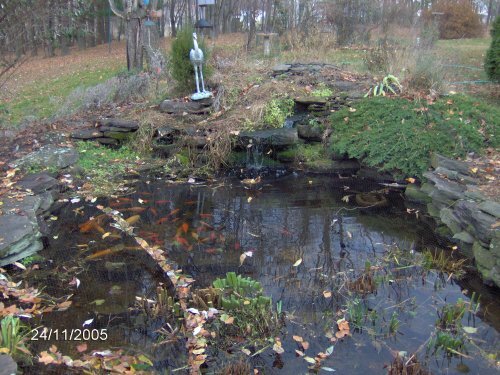 Pond facing northwest on 11/24/05. 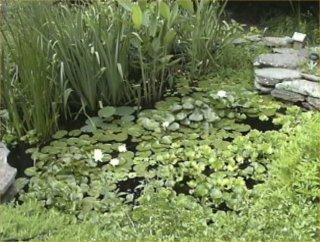 Pond full of water lettuce on 8/7/05, facing west. The net is pulled back. Note that the digital camera date stamp is day/month/year while I use month/day/year notations in my life. 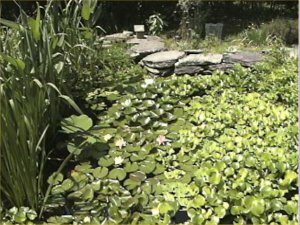 Pond full of water lettuce on 8/7/05, facing northwest. Wow! 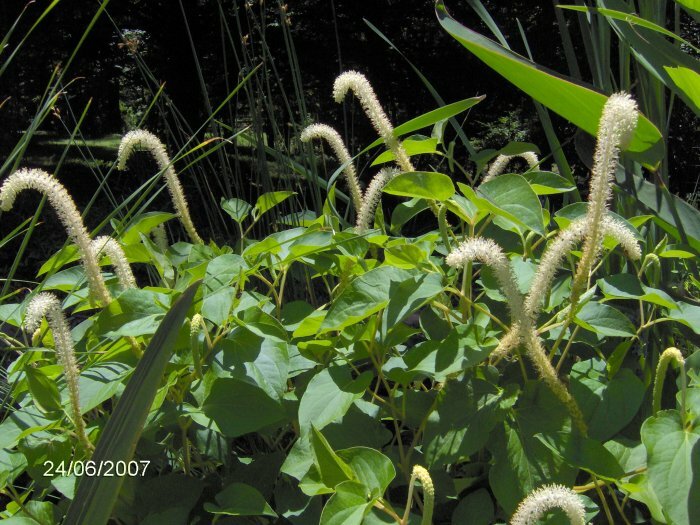 Lizard tail in bloom as well as pickerel weed in bloom on 6/26/05. 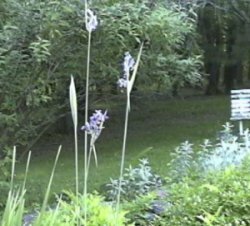 Lizard tail in bloom, larger view of the pond, facing north, 6/26/05. Fabiola lily flower in bloom on 6/26/05. 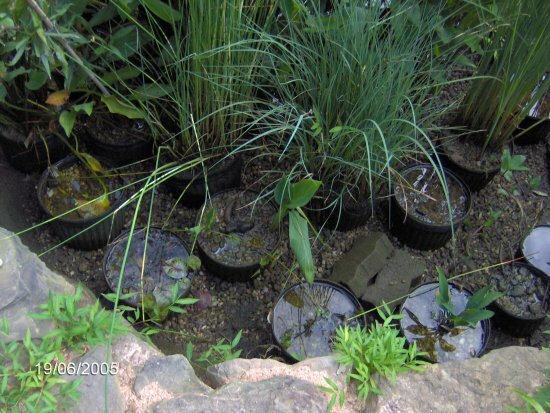 Submerged plant pots and protectors on 6/26/05 in the deep end. 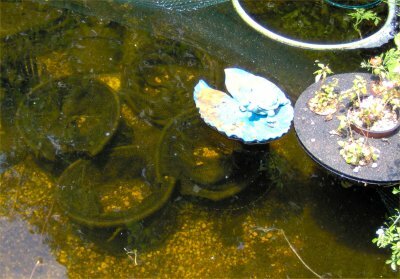 The tops collapse in instead of float and fish get stuck in them. 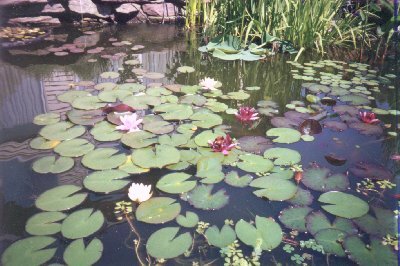 Lily pads and flowers on 6/26/05, facing west. 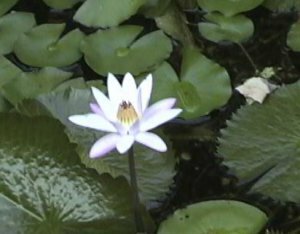 There are four waterlily flowers. From the top, they are 1 Albata, 1 Fabiola, and 2 Comanche. 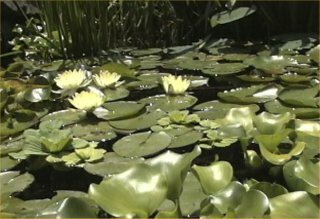 Lily pads and flowers on 6/26/05, facing west, net pulled back, farther away view than the last photo (but taken before that one as these are in reverse chronological order). 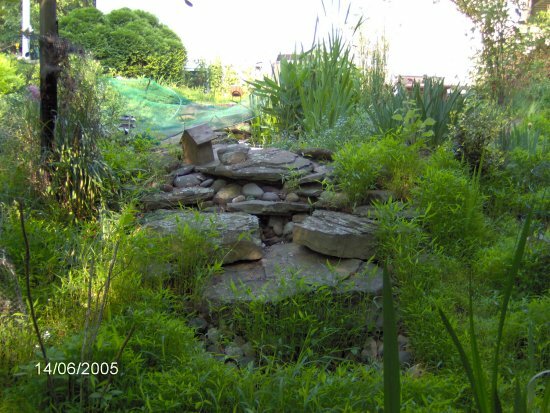 On 6/19/05, I awoke to find my 1800 gallon pond was pumped down to only a few hundred gallons thanks to the neighbor's Neopolitan mastiff who moved some of the waterfall rocks to divert water out of the pond the day before without my noticing. 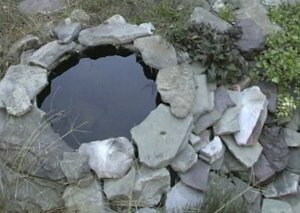 I took these photos of the pond after I had put in about 30 minutes worth of well water but the pond is still very low. Pond from down the hill, facing east towards the house, 6/14/05. You cannot see the water but this is just to show a view I have not taken a photo of before. Pond overflow facing northeast, 6/14/05. 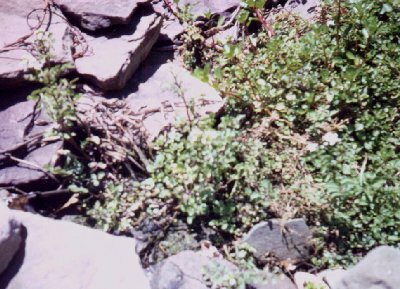 Invasive grass has grown up among the rocks. 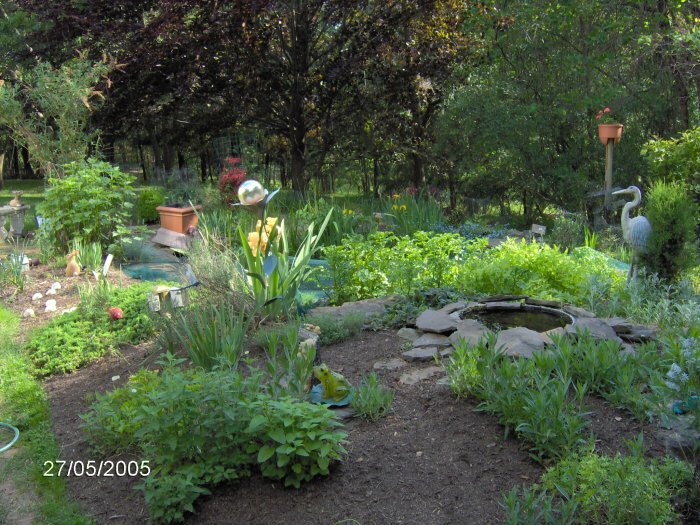 I wish I had time to do all that weeding! 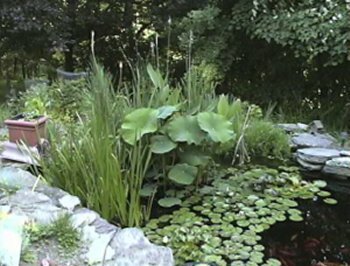 Pond facing northeast, 6/14/05. 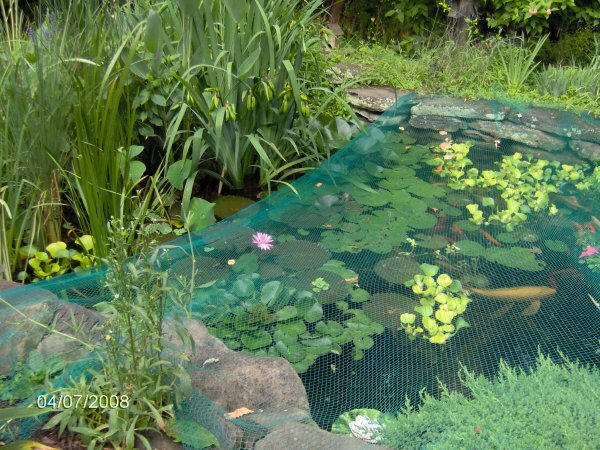 You can see the fish under the net, water celery on the left, and waterlily leaves on the right. 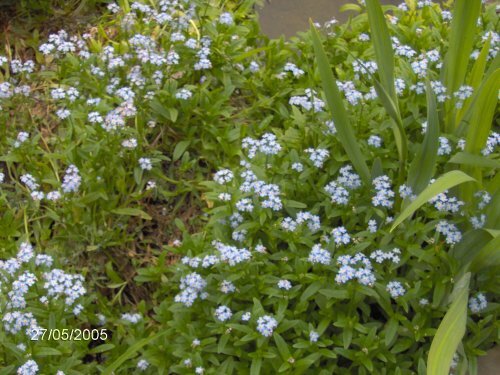 Forget-me-nots in bloom on 5/27/05 in the overflow. 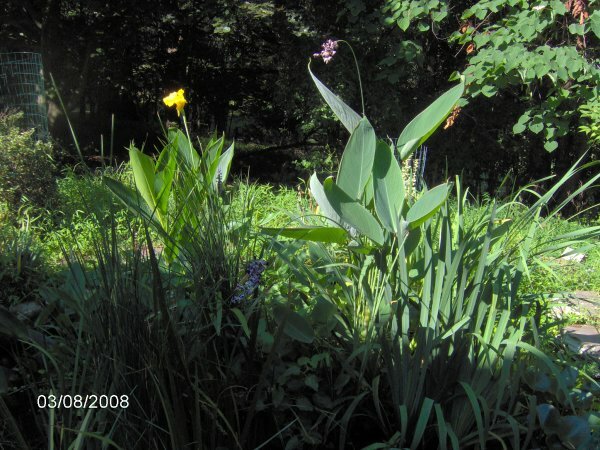 Yellow flag iris in bloom as well as some forget- me-nots in the overflow on 5/27/05. 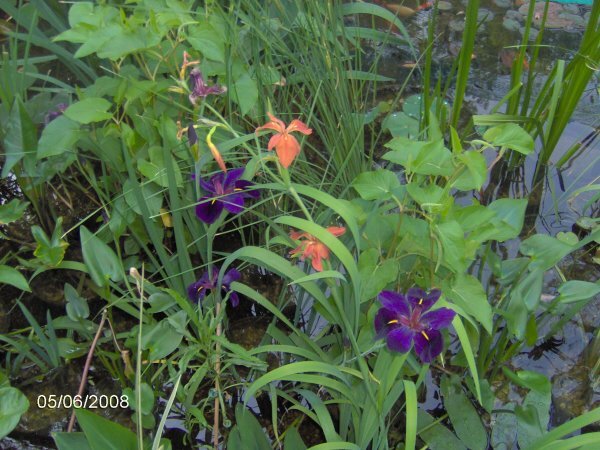 Marginal area of the pond, facing west, showing Cyprio filter, yellow flag iris in bloom, etc., 5/27/05. 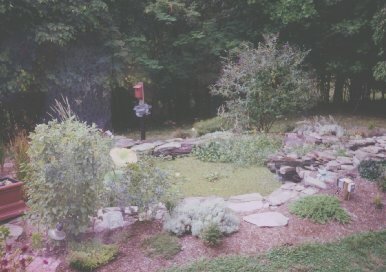 Entire pond facing southwest; water cannot be seen but this shows plants in and around the pond, 5/27/05. Pond facing north on 4/5/05, larger photo than I usually have on my site. 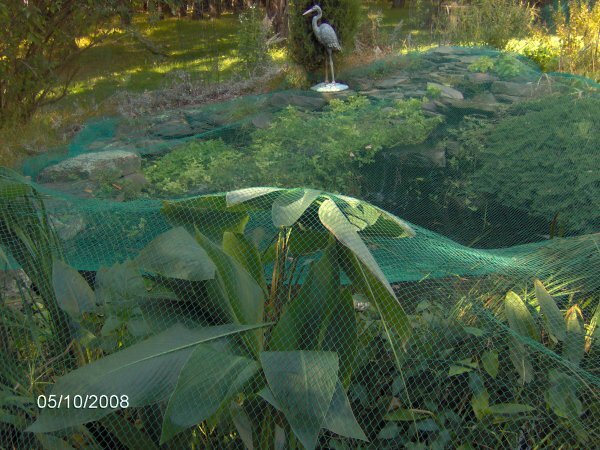 The net is to keep the herons out. Leaves all over the net with the east side pulled back, facing west, filter basket with floss is out on the right with two buckets, leaves all over the net, 11/7/04. 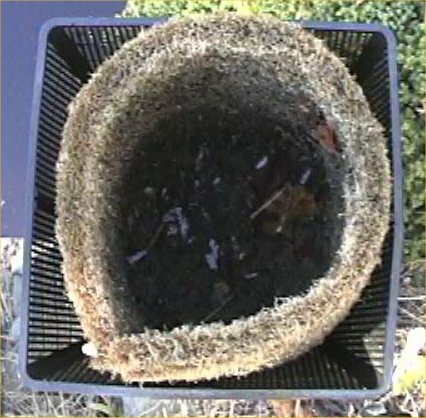 Filter floss inside the plant basket used to hold the main pump, only the inner ring of floss is in there (the rest I pulled out); this is before squirting it off, 11/7/04. 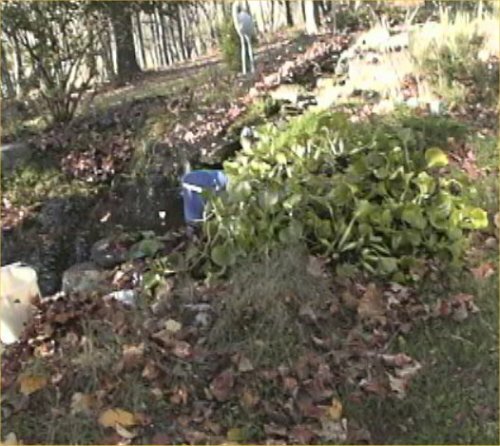 Pile of water hyacinth and leaves next to my pond on 11/7/04, facing northwest. Marginal area of the big pond after I cut down the marginals, 11/7/04, facing west. 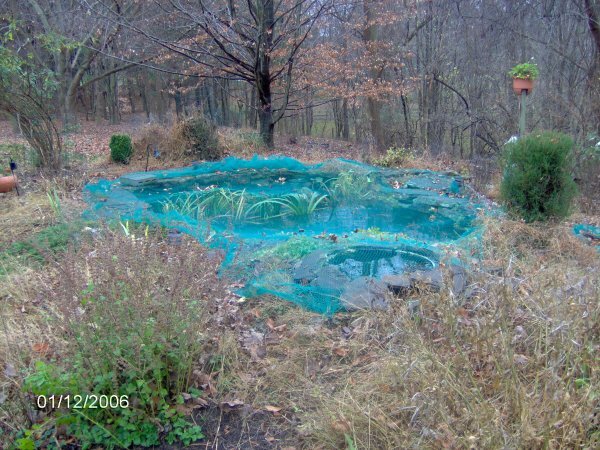 Leaves off the net after a lot of work on 11/7/04, the pond cleared of most plants. 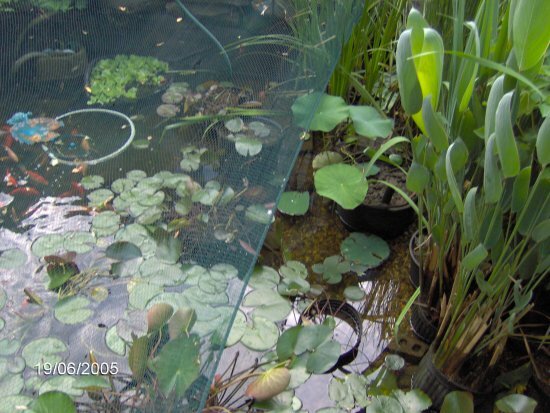 Leaves on the net of the 1800 gallon pond on 10/31/04, facing south. 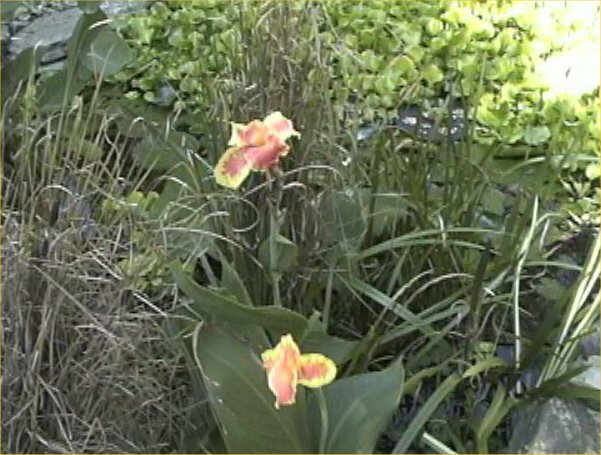 Flowering tropical tiger canna on 10/3/04. 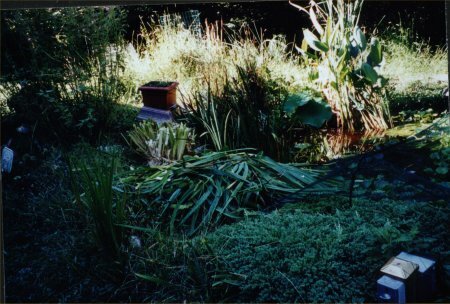 Pond facing west on 10/3/04, nets off as I changed from heron to leaf net. 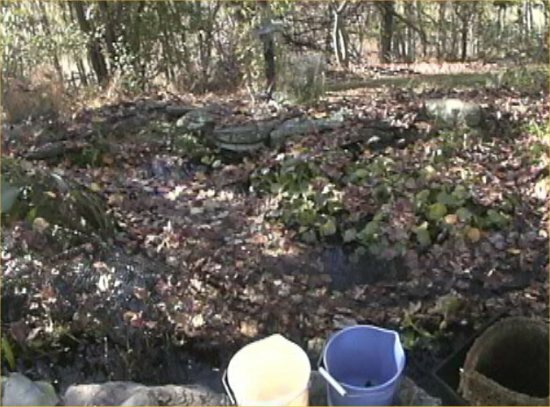 Pond facing south on 10/3/04, marginal area. 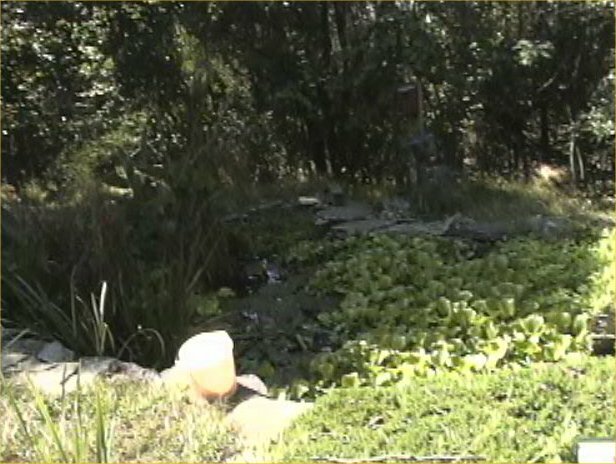 Pond facing north on 10/3/04, water hyacinth covering the deep end, water celery covering the falls. 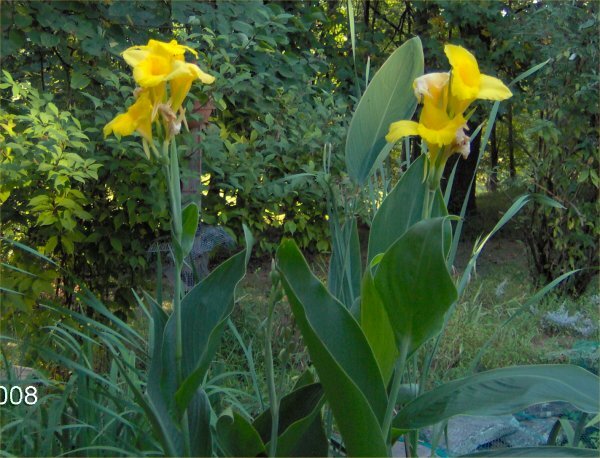 On 9/10/04, I repotted my yellow flag iris. Here are five photos of the process. I am sorry that they are so dark. They are scanned regular photos since the digital camera/camcorder had a dead battery that day. 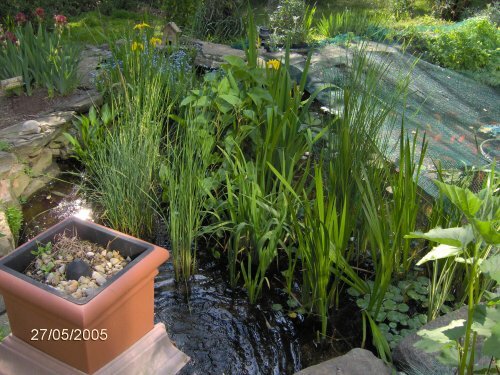 Pond facing southwest before repotting. 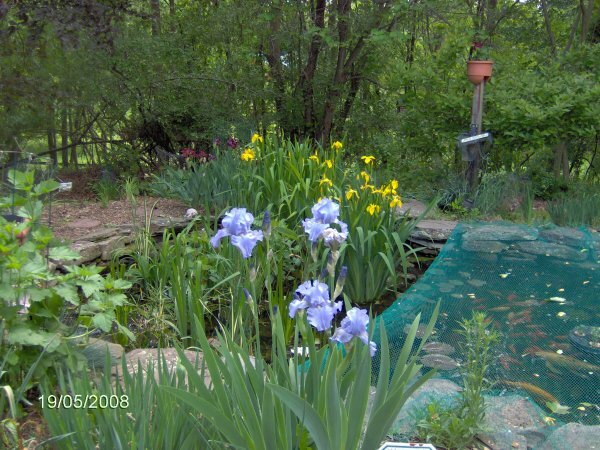 Pond facing southwest with a pile of iris. That is all from ONE plant! One can see the Cyprio filter and the electrical outlet. 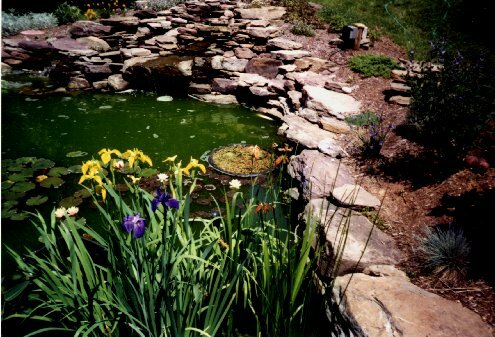 Pond facing southwest with the pile of iris. 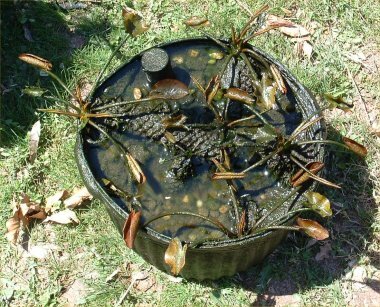 Iris monster - this is the 2 gallon pot that the iris was planted in with the surrounding overgrown root mass ball after I cut all the tops and side growths off of the plant. It is upside down in the wheel barrow. 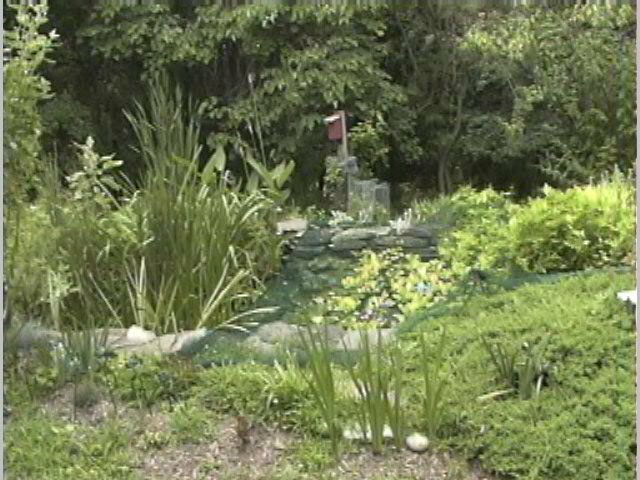 Pond facing southwest after the repotting was done. 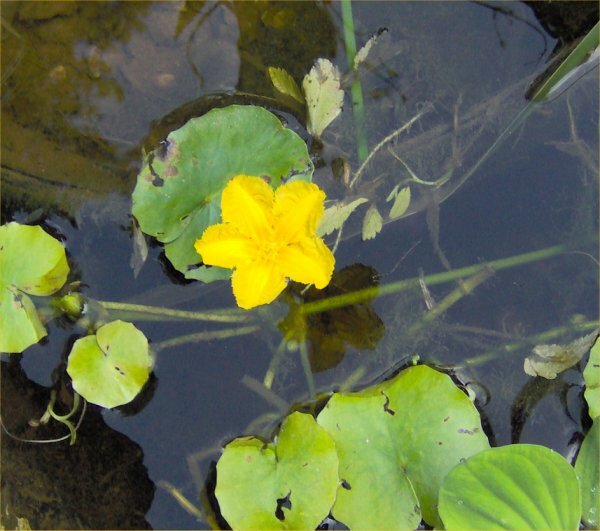 Frogfruit in flower in the overflow on 8/9/04. 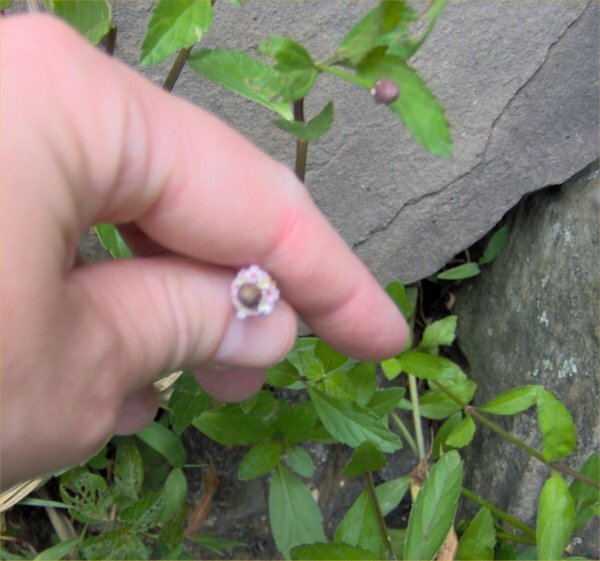 One cute flower is open and another is budding. You can see the leaves too. 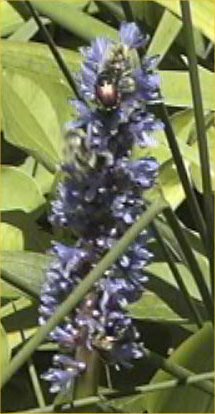 Pickerel weed flower with a Japanese beetle on it on 8/8/04. Directly down and to the left of the beetle, there is actually a bumble bee but it is moving so fast that it is barely discernable! 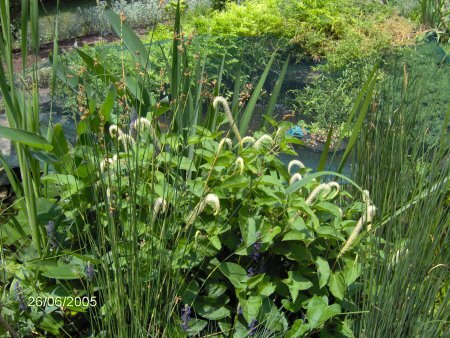 Pond with flowering pickerel weed and other marginals (like cattails with catkins) facing northwest on 8/8/04. 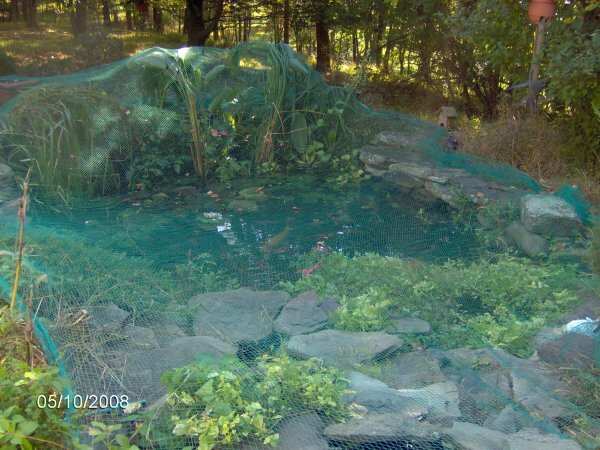 Entire Pond facing south on 7/28/04, includes the net. 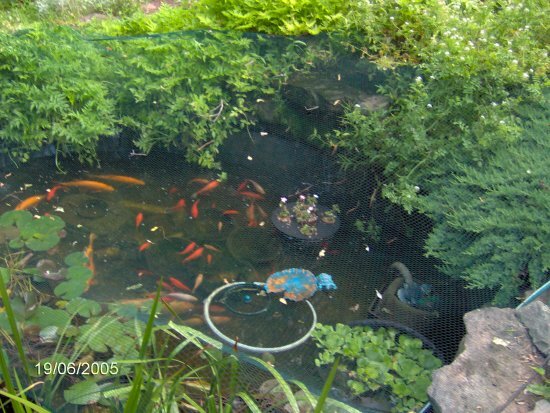 Entire Pond facing west on 7/11/04, includes the net to keep the heron out. 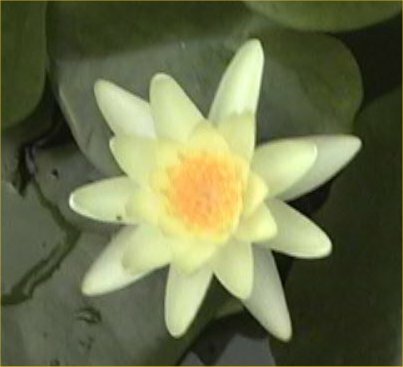 Chromatella lily flower - yellow waterlily flower on 7/11/04. 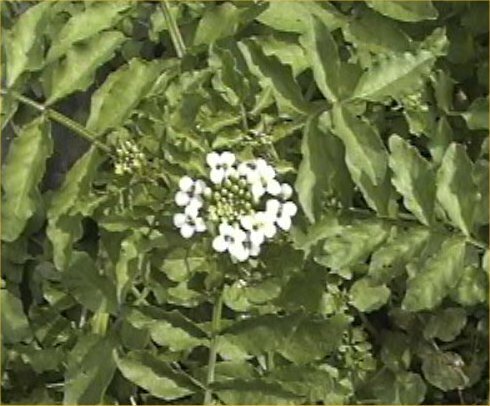 Watercress flowers close-up - 5/21/04. 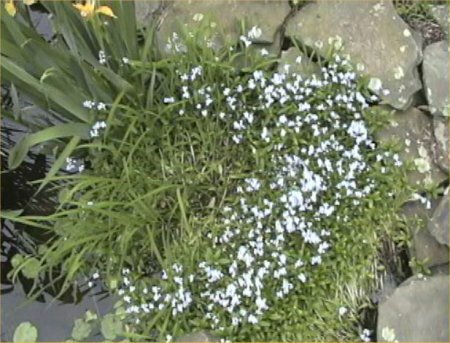 Forget-me-nots in bloom with a yellow flag iris in bloom in the overflow as well on 5/21/04. 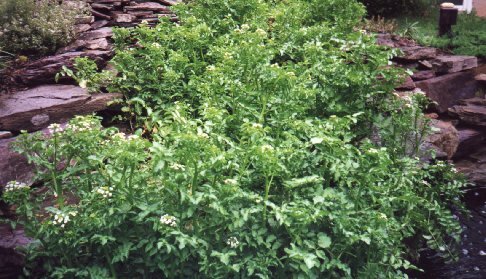 Water celery and watercress in the falls on 5/21/04. Pond overflow plus some of the marginal area, facing southeast, can see the fishing lines to try to deter the herons, 5/21/04. 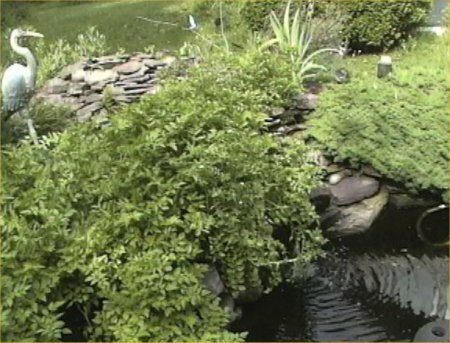 Pond overflow plus some of the marginal area and more of the pond, facing south; you can see my koi, Maggie, and the fishing lines to try to deter the herons, 5/21/04. 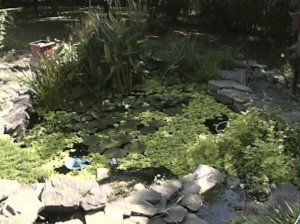 Entire Pond - 5/13/04, facing south. 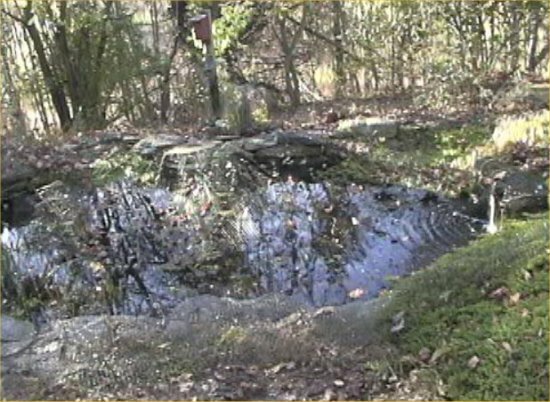 Entire Pond - 5/13/04, facing north towards the falls. 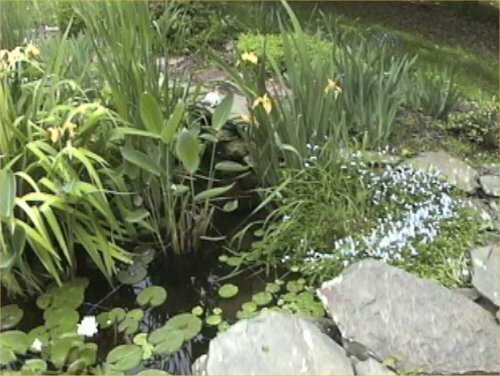 Entire Pond - 5/13/04, facing southwest and showing some of the land iris in bloom. 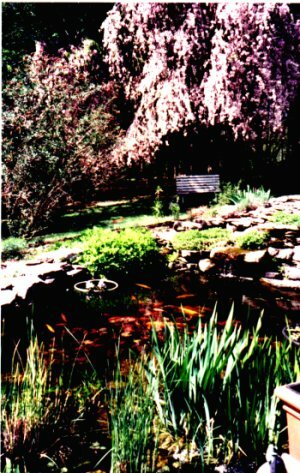 Entire Pond - 4/28/04, facing west, red bud tree in bloom, net on pond (to keep herons out), area around pond newly mulched, 20 gllon pond off to the left, Cyprio filter on left side of pond. 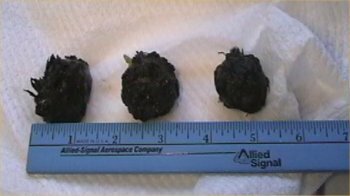 Tropical waterlily tubers - pulled from their pot on 11/9/03 for overwintering in sand. 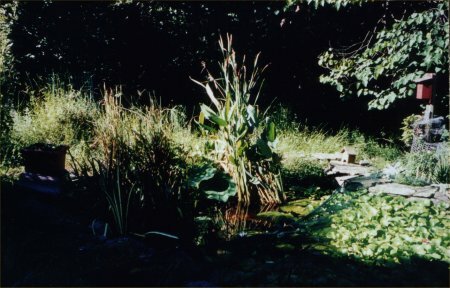 Pond facing west, full of plants, 7/26/03. 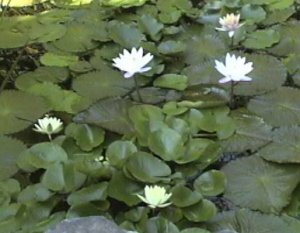 Chromatella lily flowers on 7/20/03. 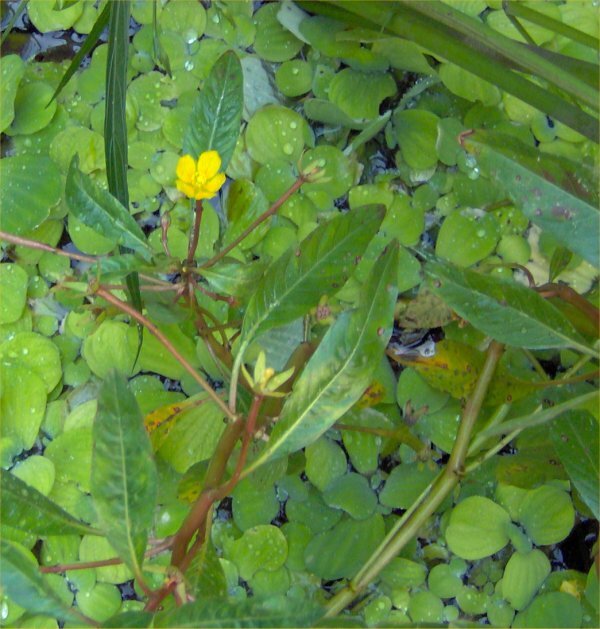 These yellow flowers were taken with me squatting in the deep end of the pond to get a side shot. Pond facing south, standing at the top of the falls, pond full of plants, 7/20/03. 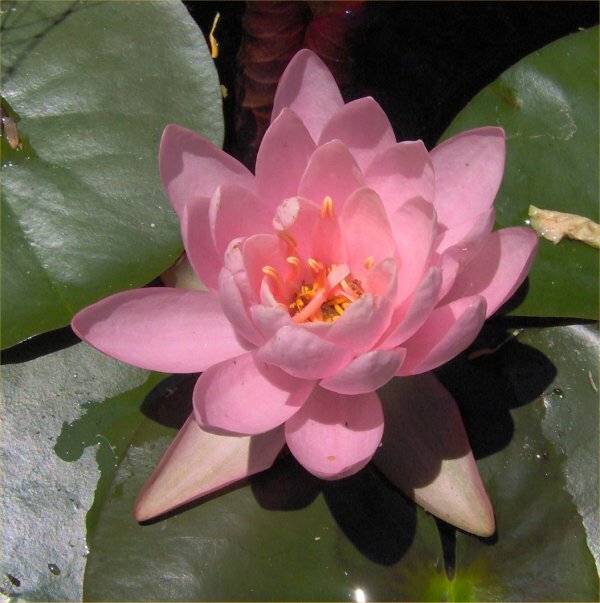 Fabiola lily - pink waterlily flower on 6/28/03. 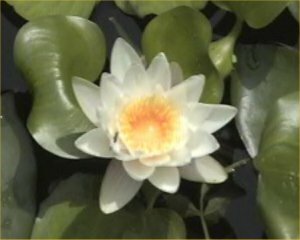 Albata lily - white waterlily flower on 6/28/03. 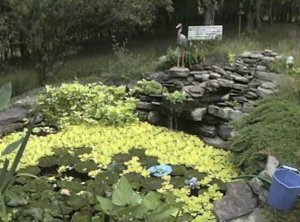 Pond facing south on 6/23/03, lots of watercress in the foreground in the waterfall. 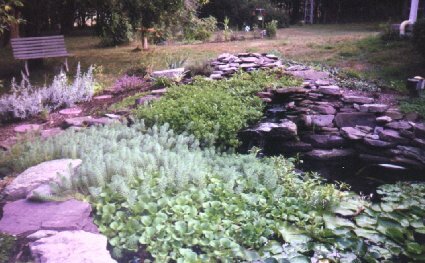 Pond facing north, 6/23/03, waterfalls full of watercress on the right and water celery on the left. 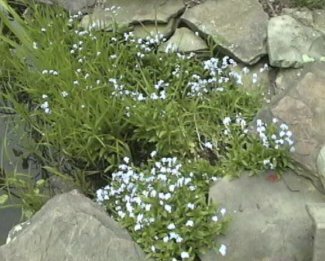 Forget-me-not flowers on 5/22/03 in the 1800 gallon pond overflow. 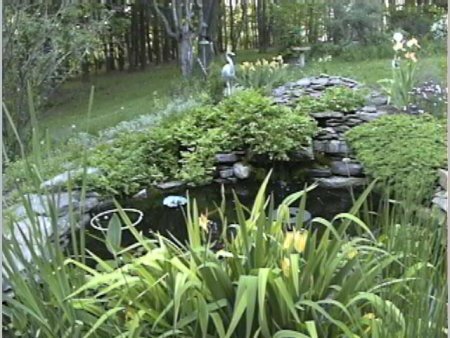 Pond facing south on 5/22/03. 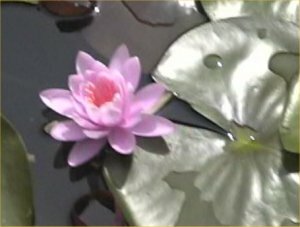 See the water celery and the pathetic water lily leaves. 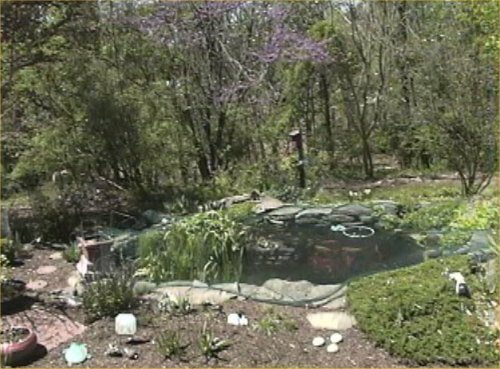 Pond facing west on 4/24/03, newly mulched! Panoramic pond photo facing north, 4/21/03, scanned photo. You cannot even see the water but get a feel for the entire area. 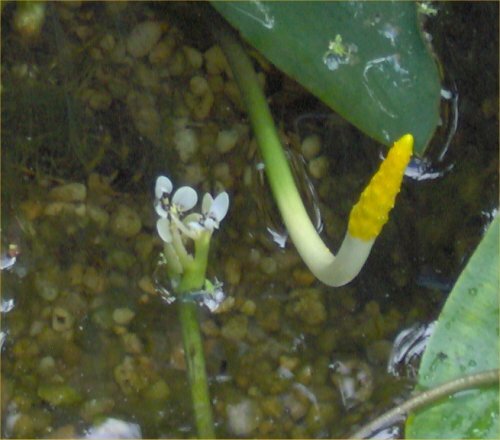 Bog bean flowers on 4/21/03. 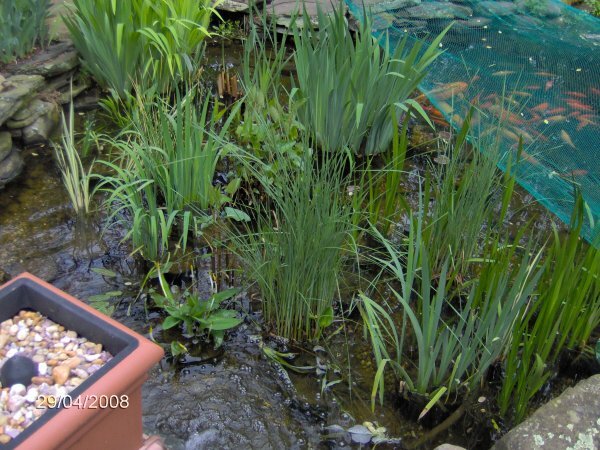 Lilies out of the pond for repotting in April of 2003. 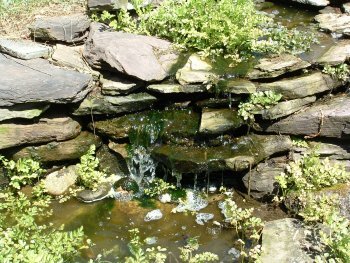 Small portion of the waterfall in April of 2003. 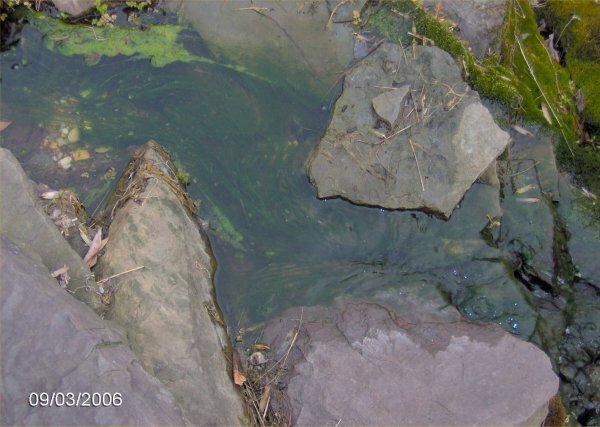 Main falls in April of 2003; water having a spring algae bloom. 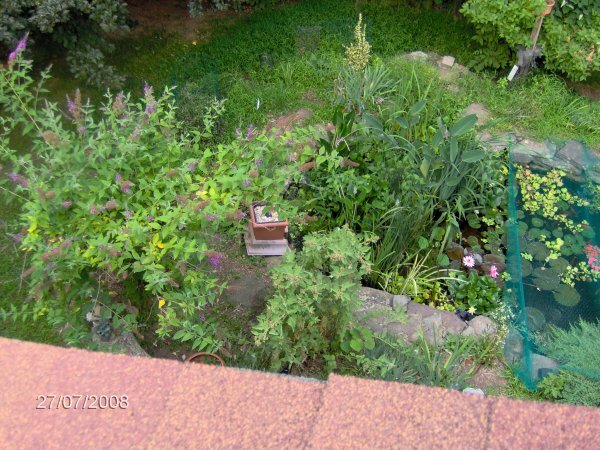 Pond facing NW on 9/21/02. 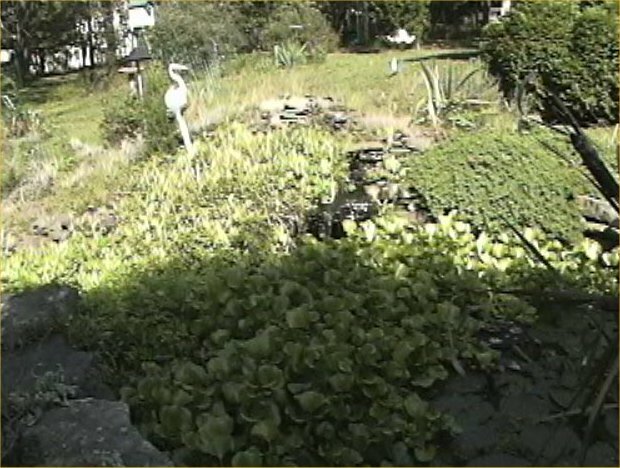 See the new heron, the waterfall, and tons of water lettuce. 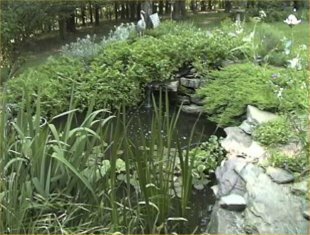 Pond facing NE on 9/21/02. 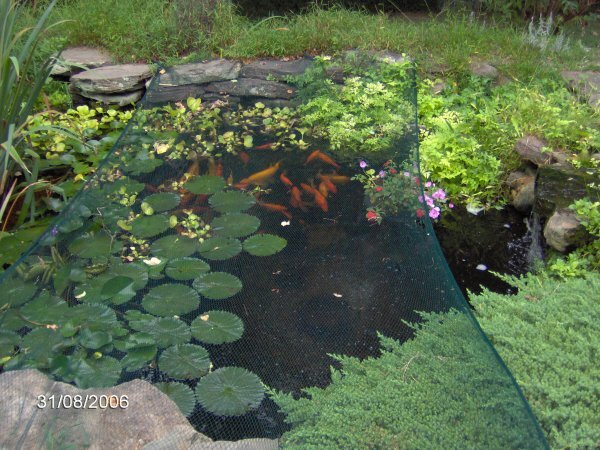 Imagine you walked around the pond. 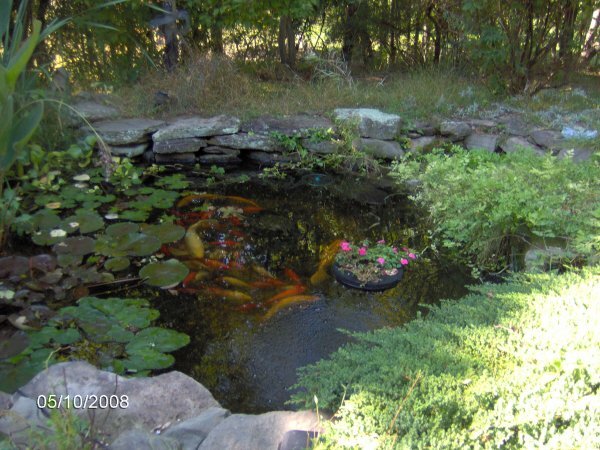 Pond facing SE into the marginals which appear smaller then they are on 9/21/02. You can use this photo and the previous two to imagine walking around the pond in September. 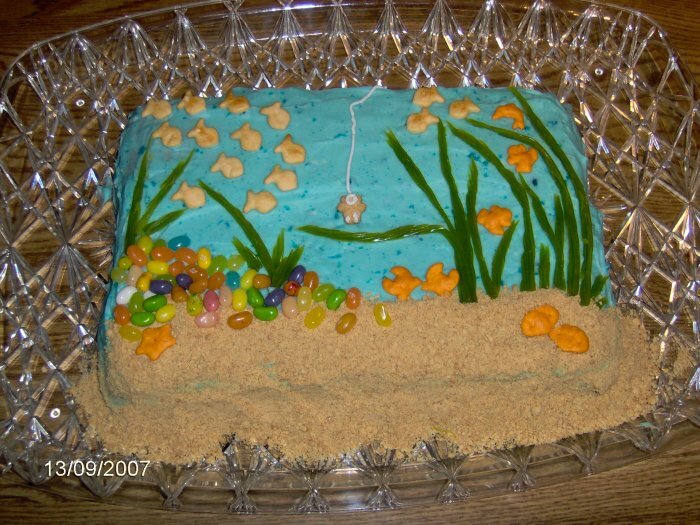 Pond Cake that my mother had made for my 30th birthday party on 9/15/02. 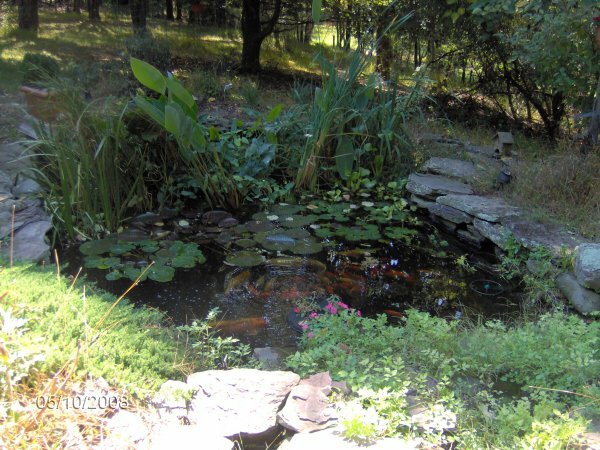 It is supposed to look like my pond and has gummy frogs and goldfish and candy lilies and green blobs. 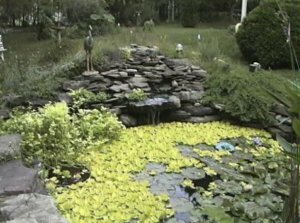 Pond facing South on 8/25/02. 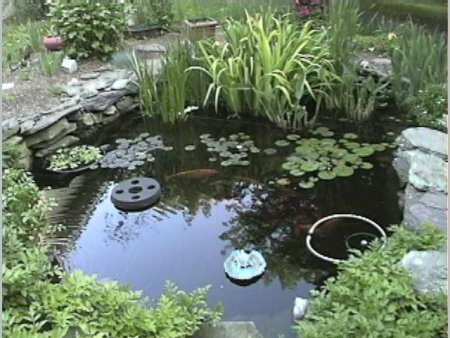 Pond facing South-South-West on 8/25/02. 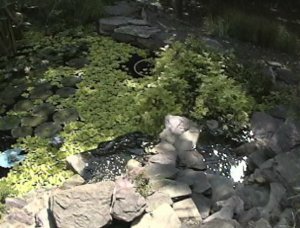 See the reflections of the water off of the water in the waterfalls and the tons of water lettuce. Pond facing Southwest on 8/1/02. 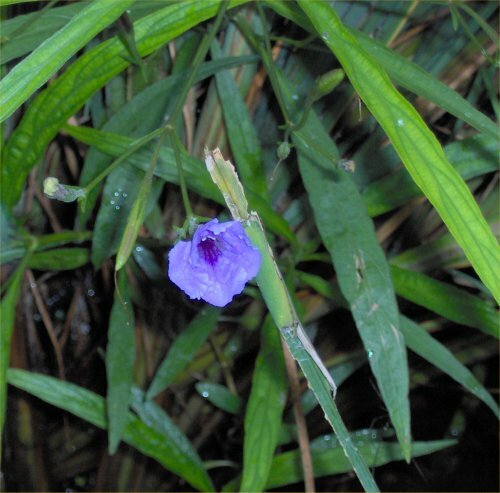 Tropical night-blooming lily on 8/1/02. 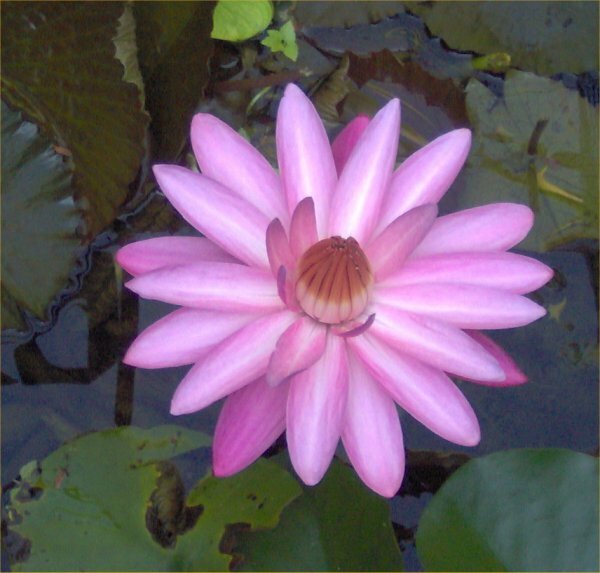 Here is the pink/white tropical night-blooming lily almost ready to close at dawn after its second bloom night. The week after this photo was taken, four of 7these opened at once! 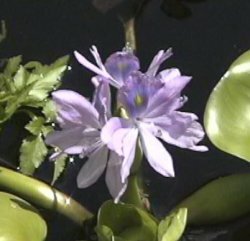 Water hyacinth flower on 6/22/02. The flower only lasts one day. This is a close-up of the hyacinths in the next photo. 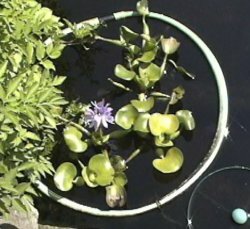 Water hyacinths in hoop on 6/22/02. 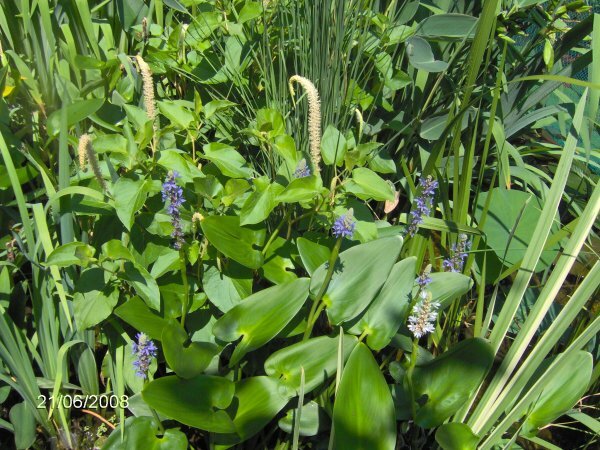 Flowering purple pickerel weed on 6/17/02. 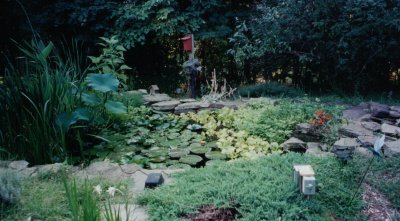 Pond facing Southwest with water lilies, sweet flag, lotus leaves, flowering hardy canna, and the Cyprio filter on the left, 6/17/02. Three hardy canna flowers taken 6/17/02. 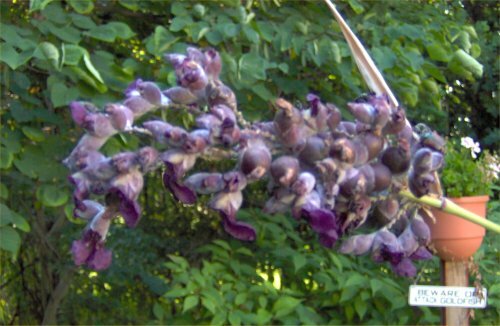 See the same flowers ( Thalia dealbata ) from far away in the above photo. Waterfall on 5/27/02. Facing Northeast, the waterfall is full of watercress. 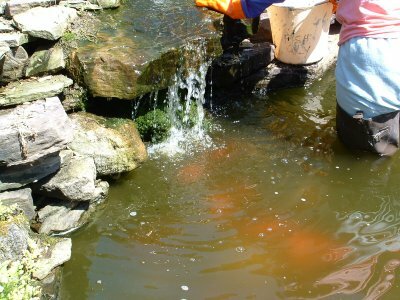 Some fish can be seen in the water to the right. 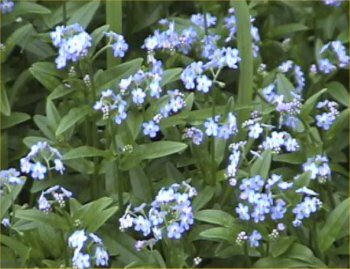 Water forget-me-not in the overflow area, blooming on 5/27/02. 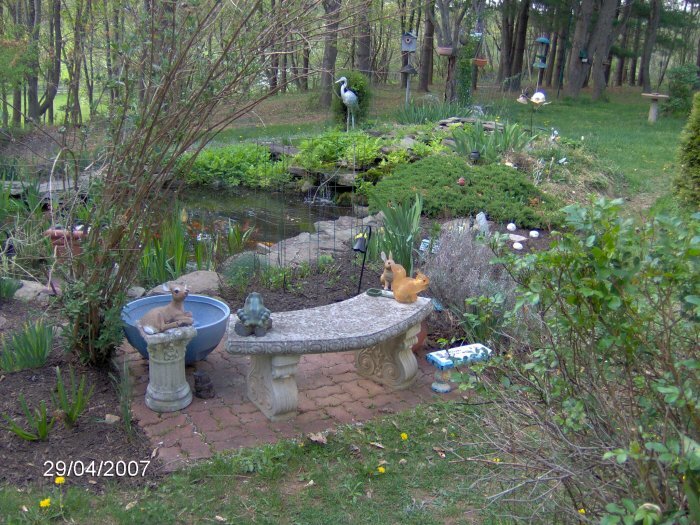 Pond in background on 3/26/02. 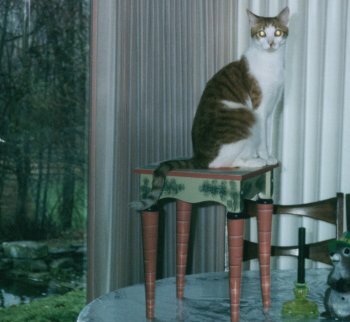 My cat, Gino, was the focus of the photo but one can see the pond through the window on the left. 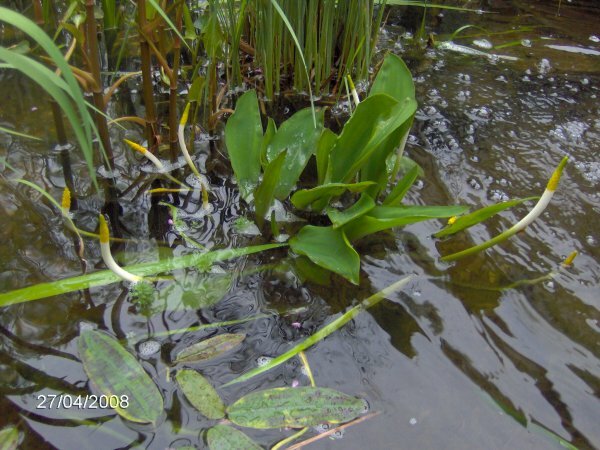 Cyprio filter and pickerel rush on 9/29/01, facing east. 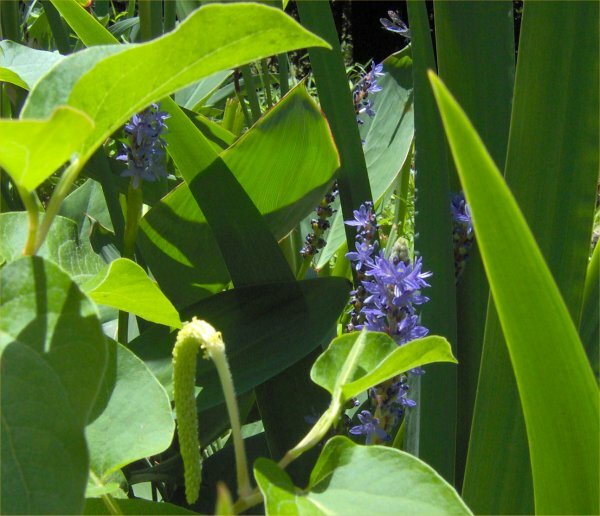 Blue pickerel weed/rush/plant flowers are on the left and white pickerel flowers are on the right. Biofilter at the head of the falls on 9/29/01, facing east. 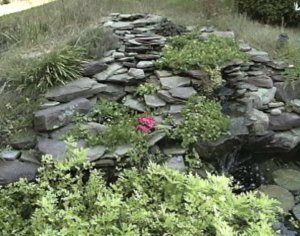 Waterfall on 9/29/01, facing northeast, impatiens flowering in the water. 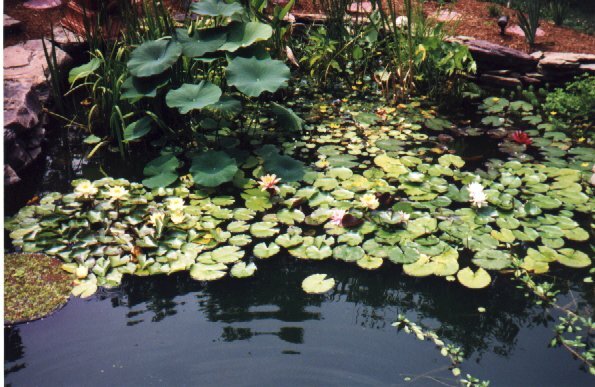 Water Lilies on 9/8/01, facing west, two pink/white tropical night- blooming lily flowers in the middle, two yellow Chromatella hardy lily flowers at the bottom, and one orange Comanche hardy lily flower at the top. 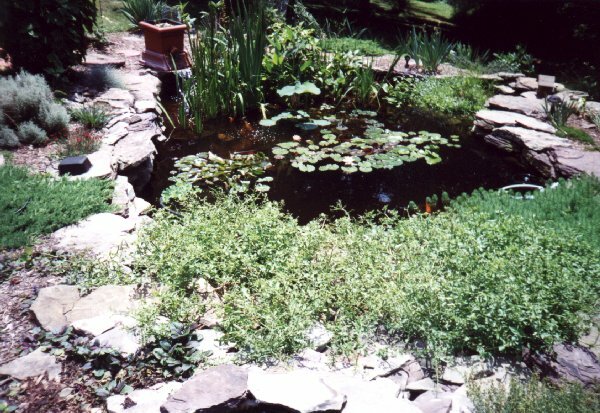 Entire Pond on 8/20/01, facing west; notice the impatiens in the waterfall. 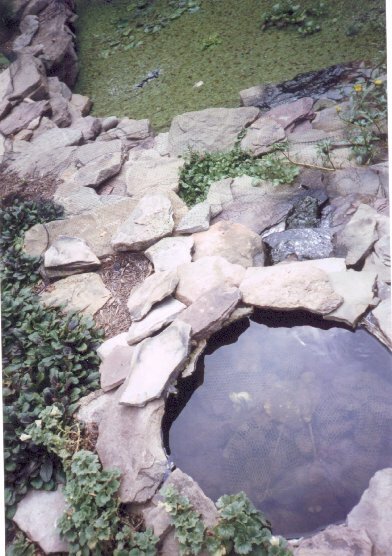 Entire Pond on 8/20/01, facing north; notice the impatiens in the waterfall. 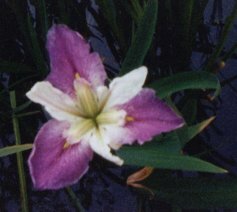 Tropical lily flower on 8/14/01. 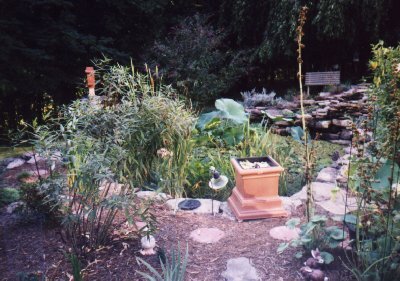 Pond on 7/14/01, facing southwest. 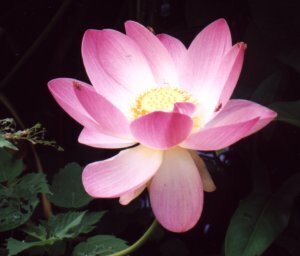 Lotus flower in June 2001 in main pond, unknown variety (they sold me the wrong one!). 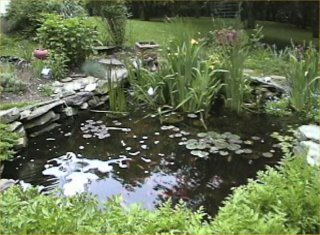 Pond on 6/3/01, facing west. 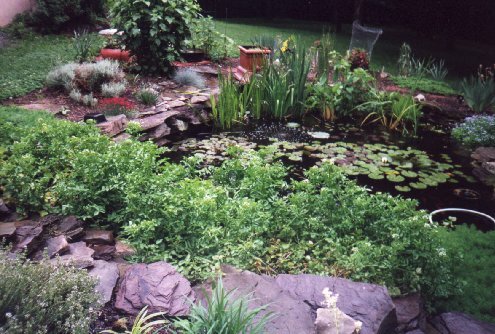 Pond and Waterfall on 6/3/01, facing north, watercress blooming on the waterfall and water celery on the left of the waterfall. 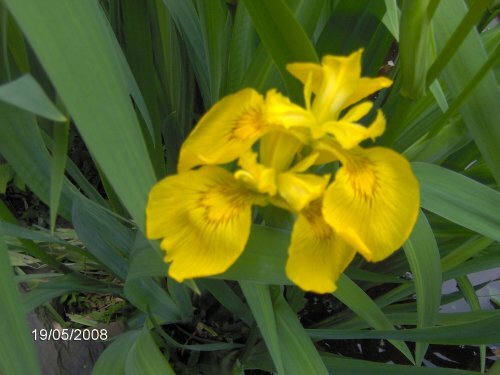 Colorific iris flower on 5/29/01 (not added to web site until 9/4/02 since it was on an old roll of film). 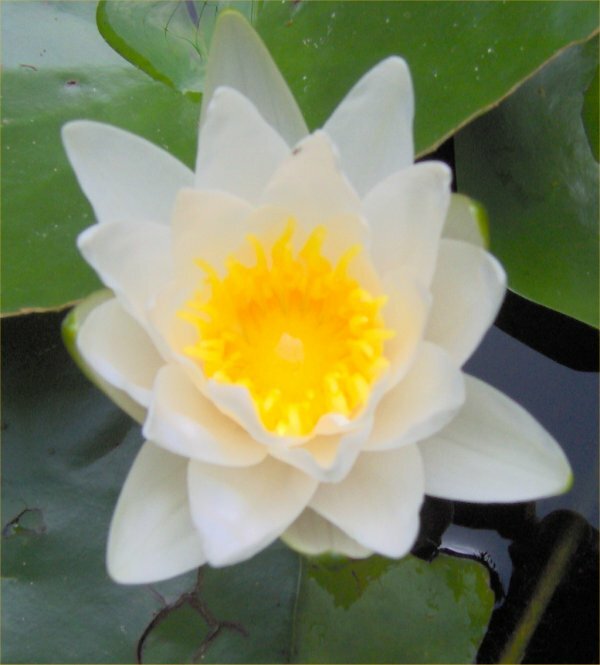 This flower is a real beauty! Entire pond on 5/27/01; my brother took this photo from the roof so it is an aerial view! The west end is at the top. 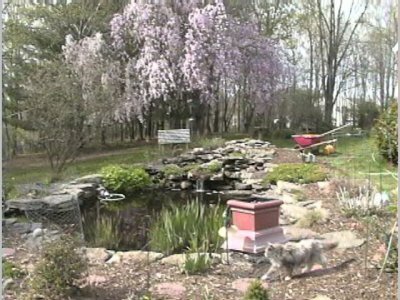 Pond on 4/30/01 including the weeping cherry, facing north. 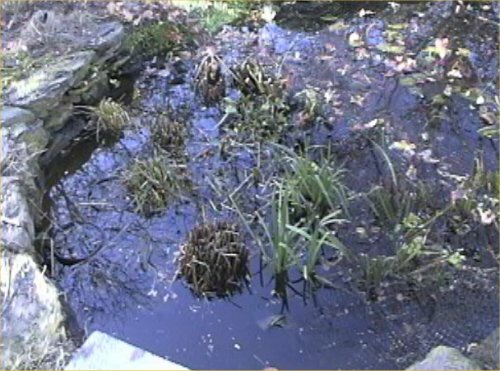 Pond on 4/22/01. The weeping cherry tree is in full flower. It is so beautiful! 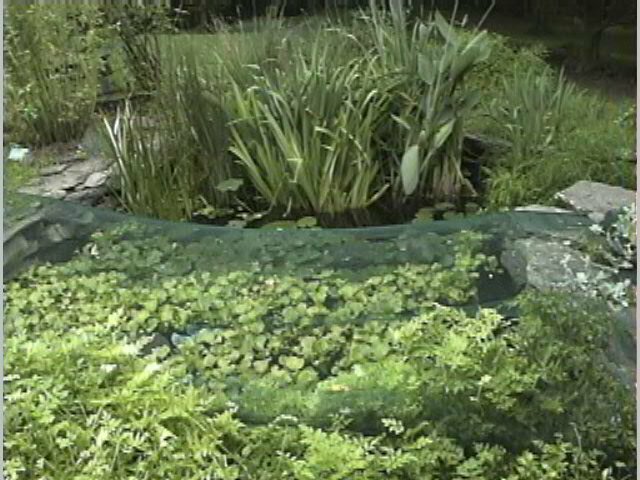 The pond does not look great yet but you can see the water celery growing well. My cat, Samantha, is strolling around at the bottom right of the photo. 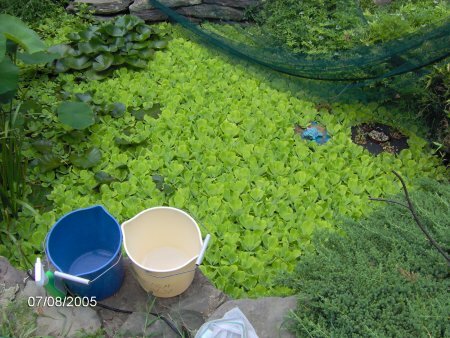 Pond, watercress dying back, iris recovering from severe hail storm, Cyprio filter on upper left, bright day, 6/18/00. Feeding time, next photo after above photo as I approach for evening feeding, fish stir the surface, parrot feather at the bottom, feeding ring on the right, 6/18/00. 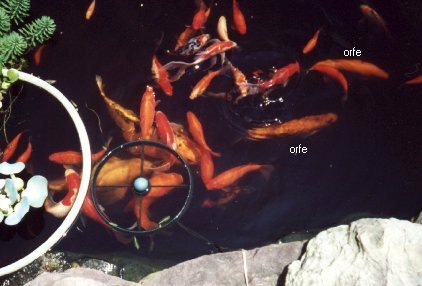 Fish, fish going crazy for food, the two orfe in the photo are marked, 6/18/00. 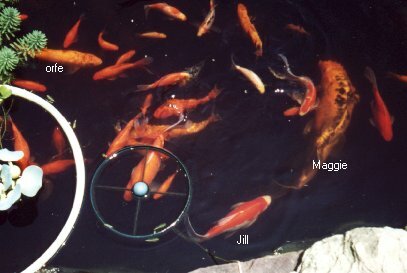 Fish, fish continue going crazy, the orfe, my butterfly koi Maggie, and my comet Jill (who with Jack are the oldest fish in the pond) are marked, 6/18/00. 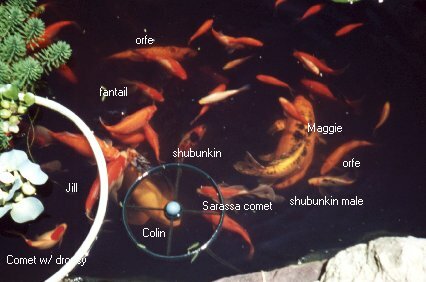 Fish, fish tiring of waiting (I fed them right after the photo), orfe, fantail, koi Maggie, koi Colin, two shubunkins (their baby Bunky is also in the photo but was hard to mark, she is on top of Colin), Sarassa comet, Jill, and a comet with dropsy (for almost a year) are marked, most small fish seen are yearling goldfish, 6/18/00. 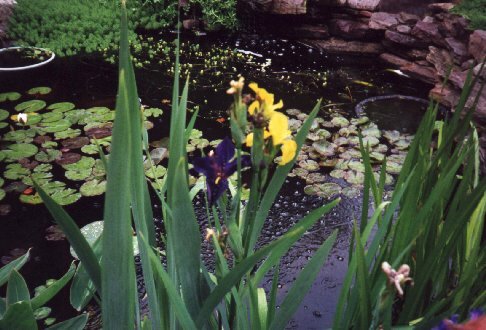 Iris, purple water iris, yellow flag iris in bloom, lilies in background, it was raining, sweet f�ag on the right, 5/23/00. 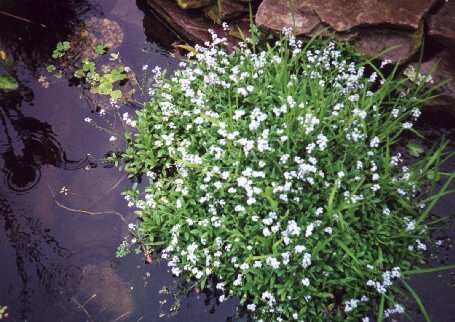 Water Forget-Me-Not, flowering blue forget-me-not with some wild water grass mixed in and water clover in the upper left, in the overflow area, 5/23/00. 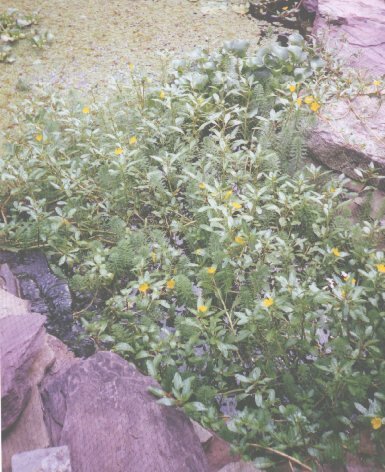 Watercress, waterfall with flowering watercress, biofilter at upper left, electrical outlet at upper right, facing northeast, 5/23/00. 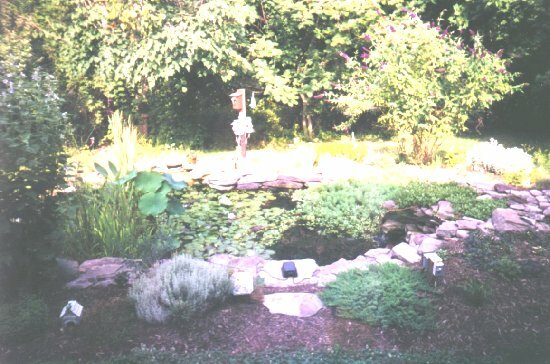 Pond facing south, watercress blooming on waterfall, parrot feather on the right, Cyprio filter visible at the far end, 5/23/00. 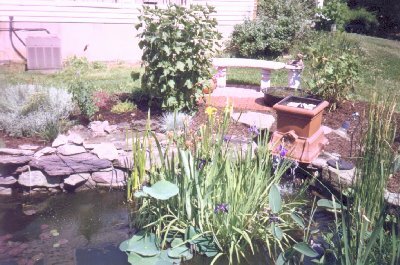 Entire Pond view from inside the house, shows watercress in waterfall, parrot feather in upper right, lilies, lotus, iris, rocks, etc. ; facing west, 7/3/99. 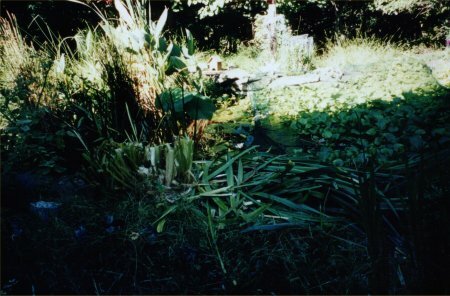 Plant overload showing watercress in the foreground along with parrot feather on the right and water hyacinth and lilies in the main part of the pond, taken facing south, 8/11/99. 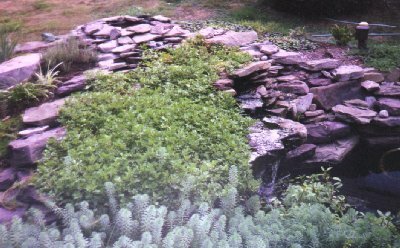 Watercress overloading the waterfall, biofilter at the top, parrot feather at the bottom, facing northeast, 8/11/99. 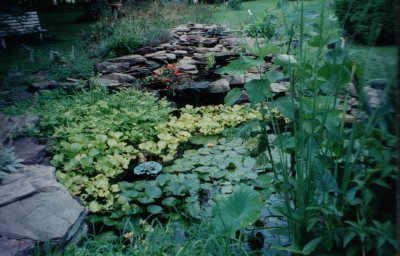 Plant overload showing watercress on the waterfall, parrot feather on the left, water hyacinth in the middle, and lilies at the bottom, facing north, slightly east, 8/11/99. 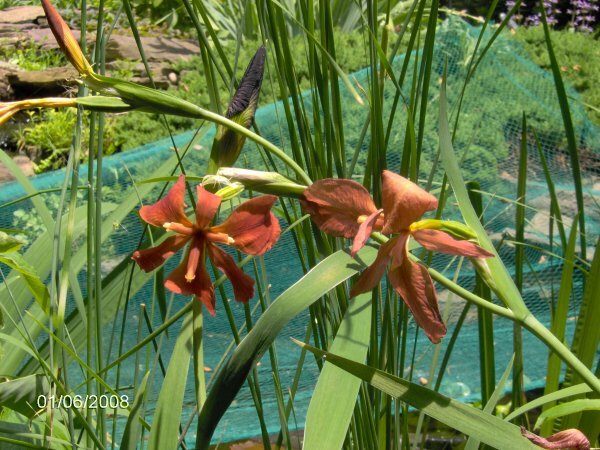 Lilies including William Falconer (red), Fabiola (pink), Comanche (orange, at top), and Albata (white), 5/31/99. 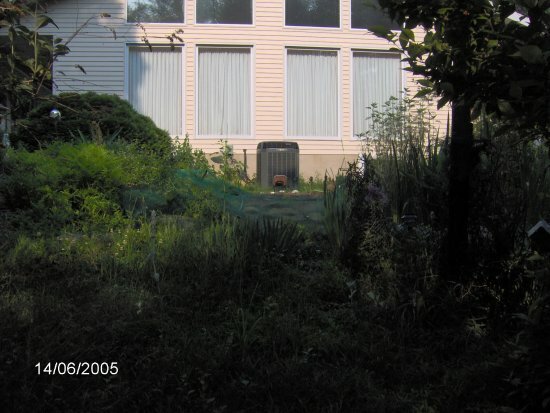 Iris also shows location of supplemental filter, bench, 20 gallon tub pond, and house in relation to the pond (only photo that shows those things I belive, facing east, 5/31/99. 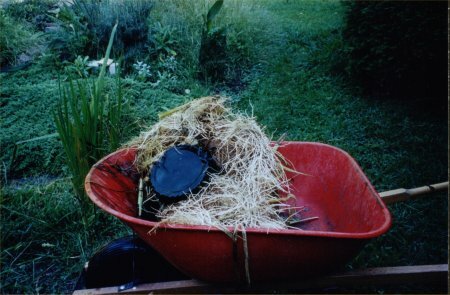 Iris up close, hose filling pond, aerator next to it (black box), ring with salvinia, lilies just sprouting, 5/31/99. Lilies including William Falconer (red), Fabiola (pink), Comanche (orange at top), and Albata (white), 5/31/99. 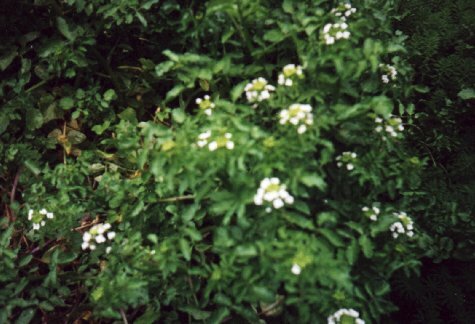 Watercress in bloom on the waterfall (hard to see the white flowers), 5/28/99. Parrot Feather in the waterfall overflow area, facing south, 5/28/99. Waterfall view looking from the biofilter down into the salvinia and water hyacinth covered deep end, 9/19/98. 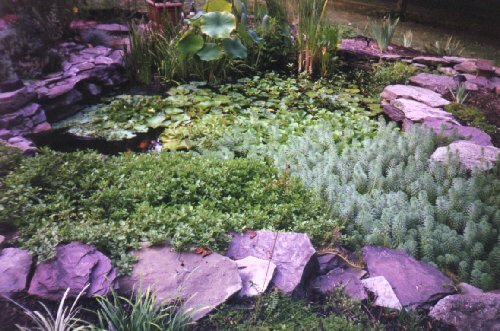 Plants: creeping primrose, parrot feather, salvinia, water hyacinth, and salvinia over the pond, view facing South, 9/19/98. 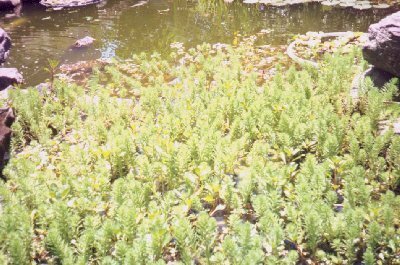 Entire pond facing north-west, completely covered in salvinia, 9/19/98. 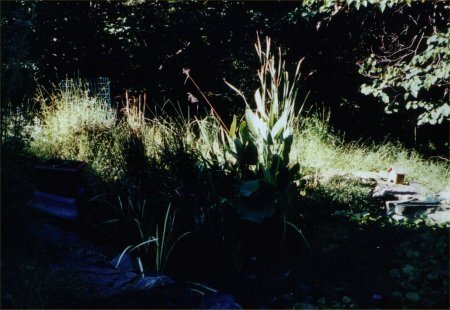 Plants in the waterfall area, 7/26/98. 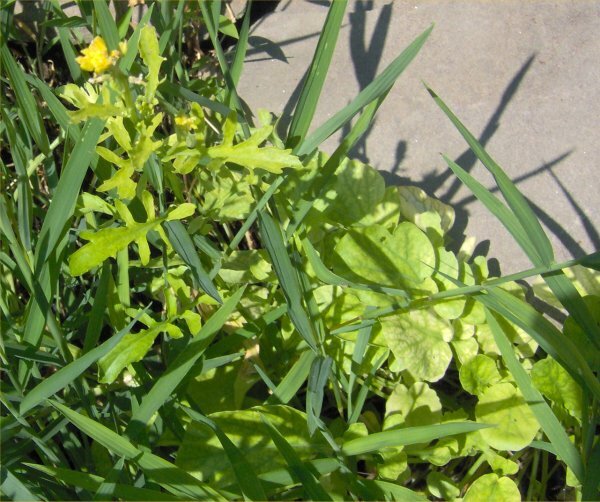 The plant with the yellow flower is creeping primrose. 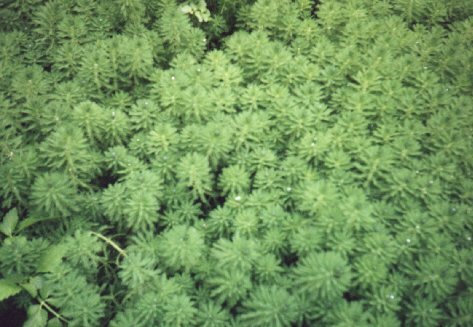 The frilly green plant is parrot feather. 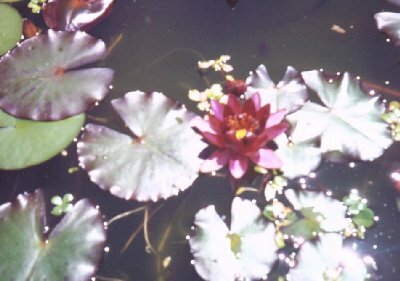 All 5 lilies blooming, non-blooming lotus, and other plants, late July 1998. Lilies left to right - Chromatella (yellow, small), Comanche (orange/yellow, big), Fabiola (pink, big but few flowers), Albata (white, very big), and William Falconer (red, small). 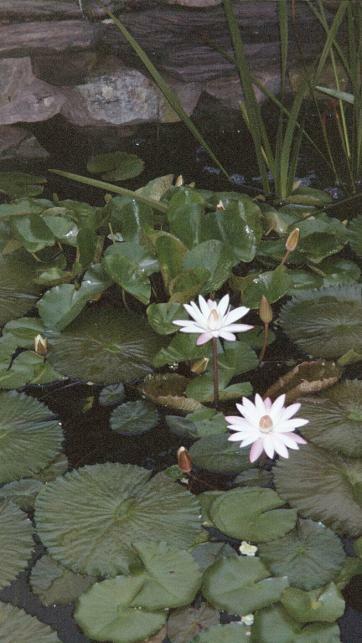 White albata lily and lily pads, July 1998. **Best photo!! 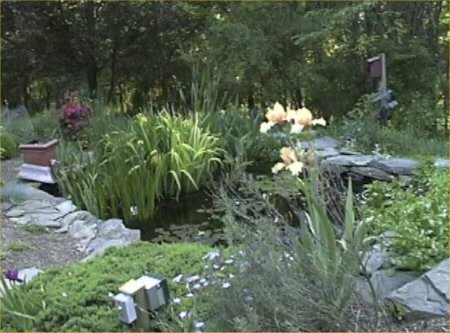 Iris and waterfall, facing North. 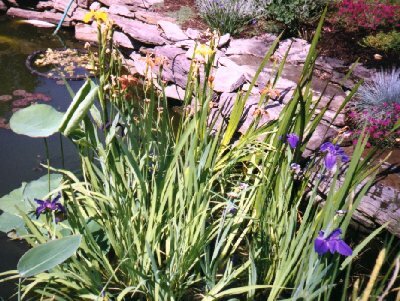 Blue, yellow, and red iris in bloom, yellow (Chromatella) and orange (Comanche) lilies in bloom, 5/16/98. Top of waterfall, bad picture, will not scan well, facing west, 4/12/98. 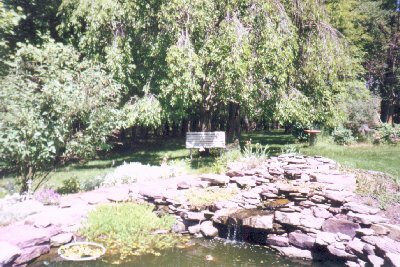 Waterfall with blooming weeping cherry behind, facing north-west, 4/12/98. Bog area and bench, facing south-east, 4/12/98. 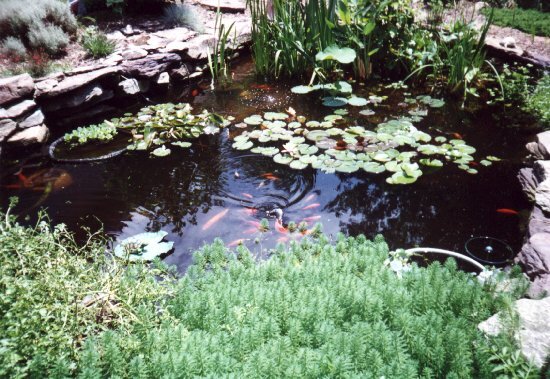 The large pond at two months old, facing north-west, July, 1997. 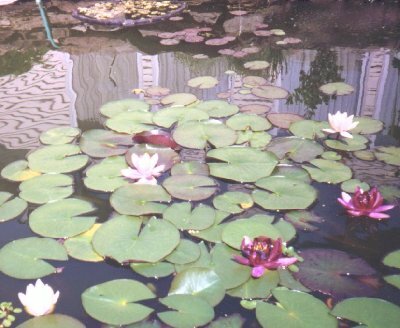 Lilies in my big pond on July 21, 1997. The two white ones are albata, the pink one is Fabiola, and the orange one at the top is a Comanche. 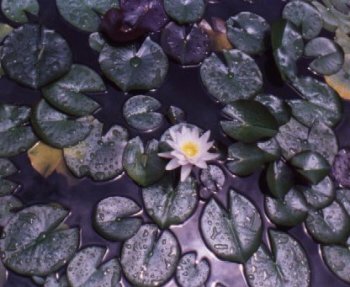 The albata put out the most weight of leaves, the Chromatella (out of sight) put out the most leaves (a smaller kind of lily), while the Comanche flowered the most. All flowered heavily except the Fabiola which only put out half a dozen flowers all season. 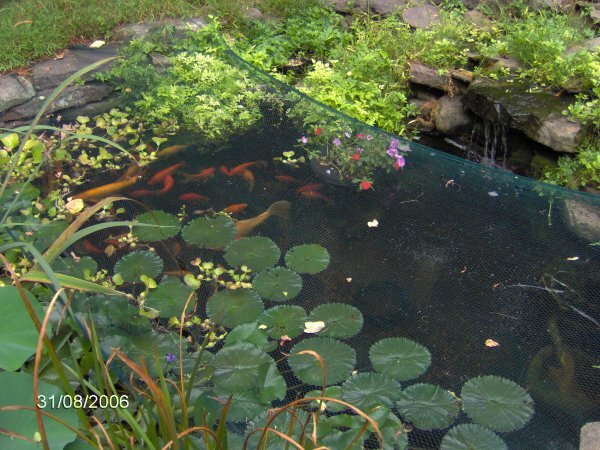 This is the photo that used to be at the top of my pond page index.